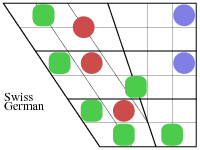 Click on a diagram to see a larger version. 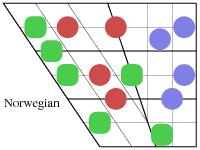 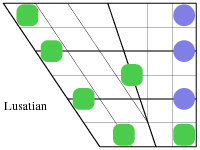 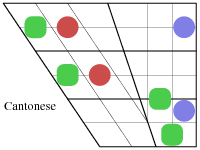 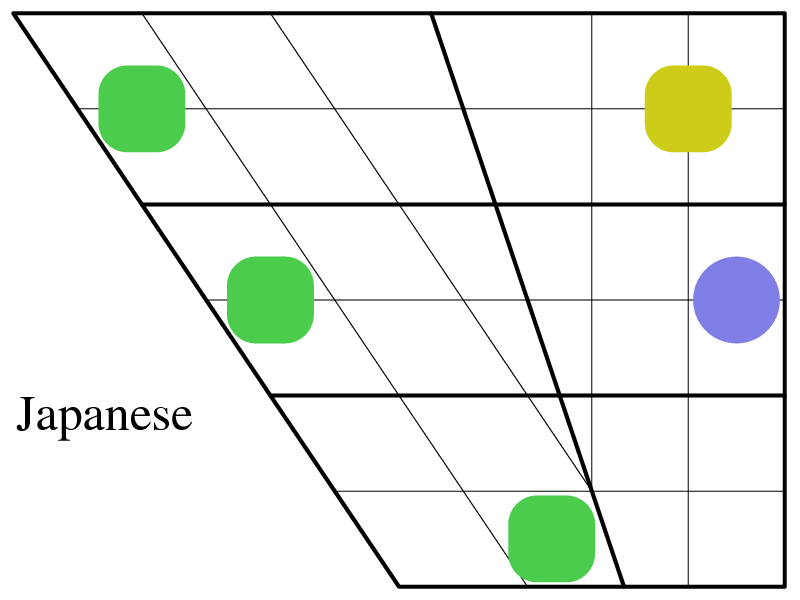 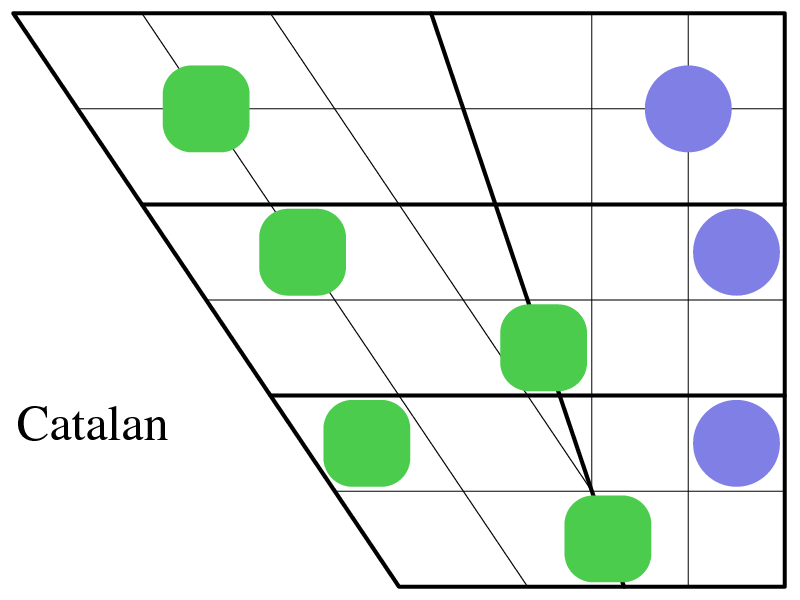 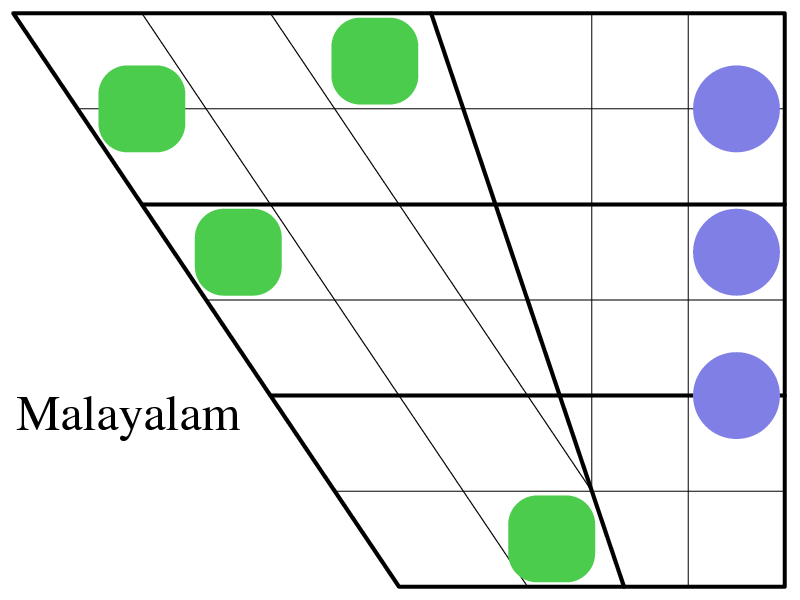 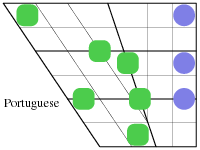 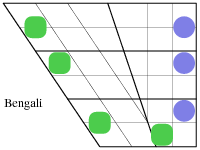 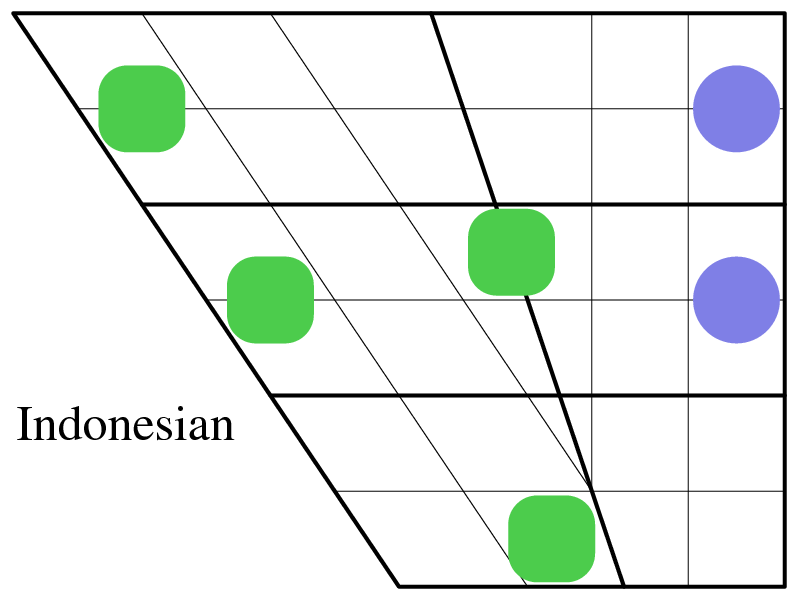 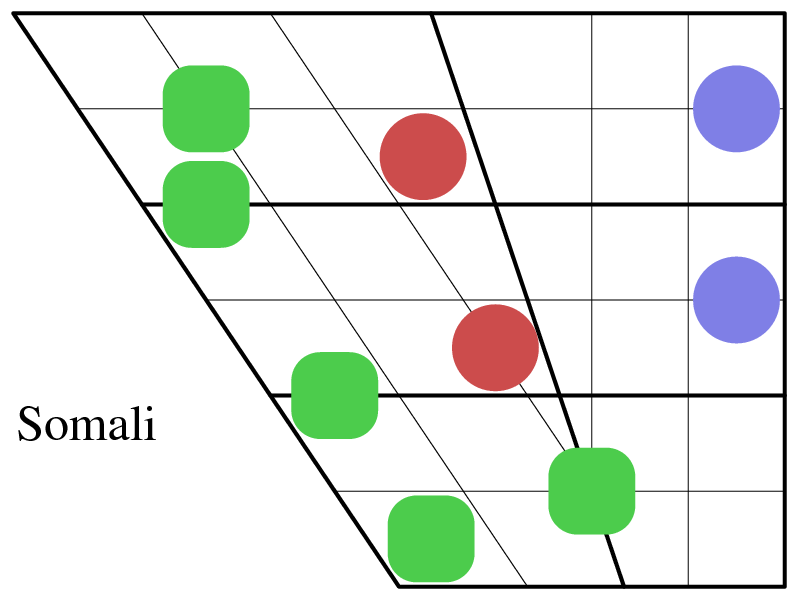 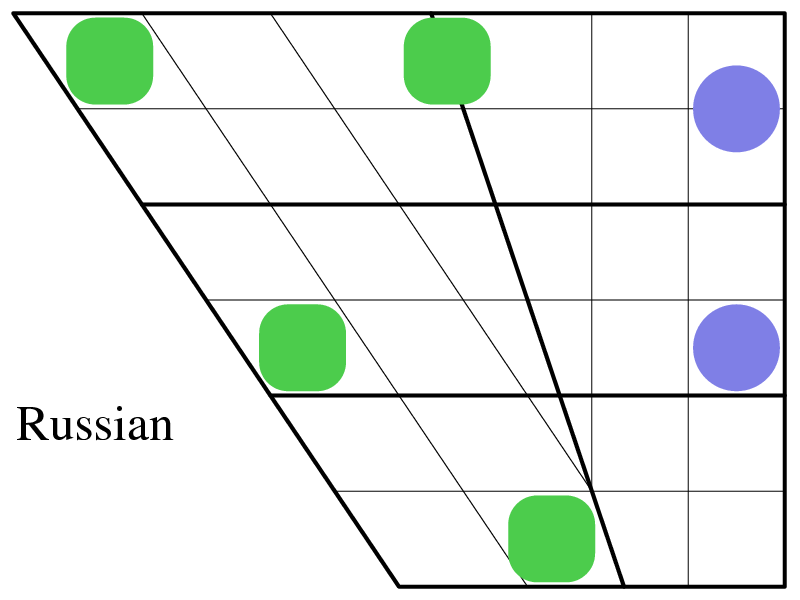 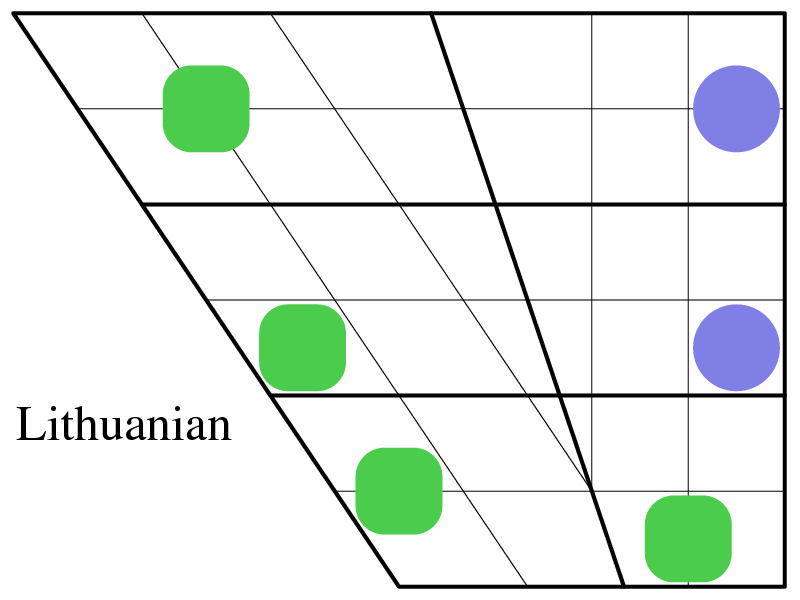 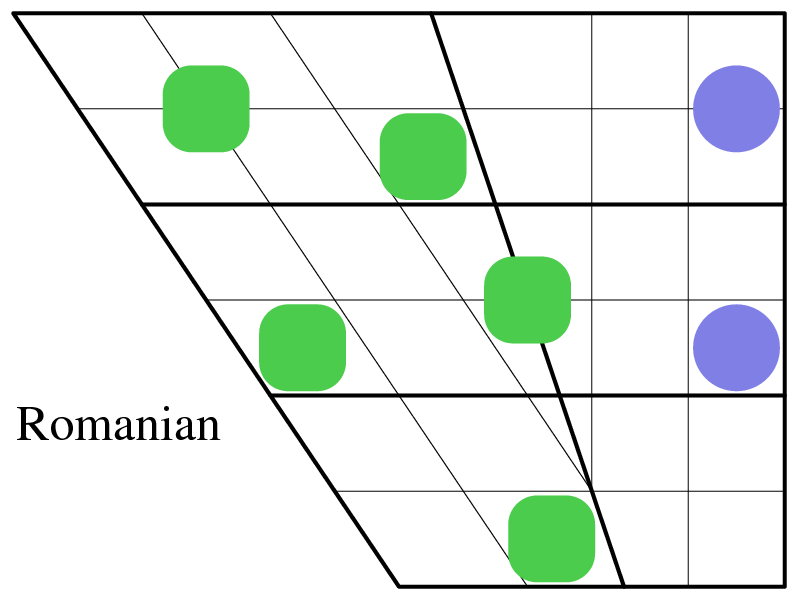 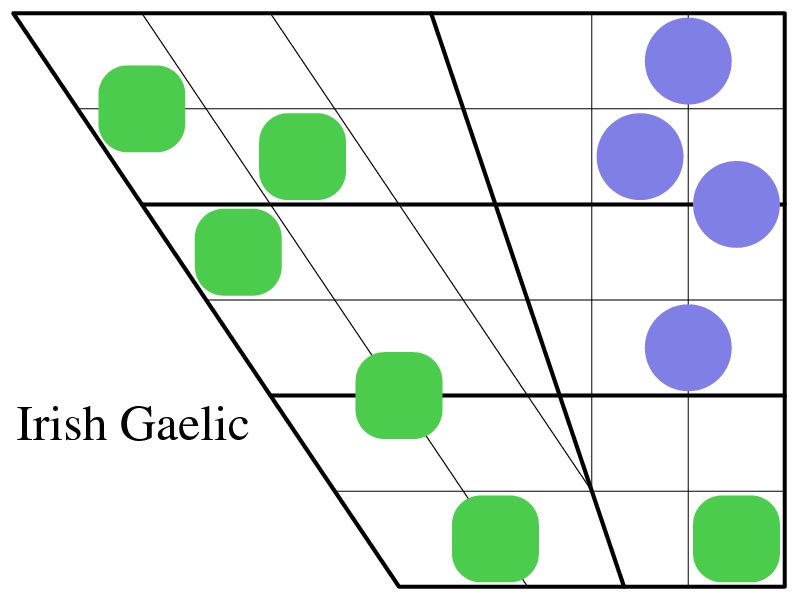 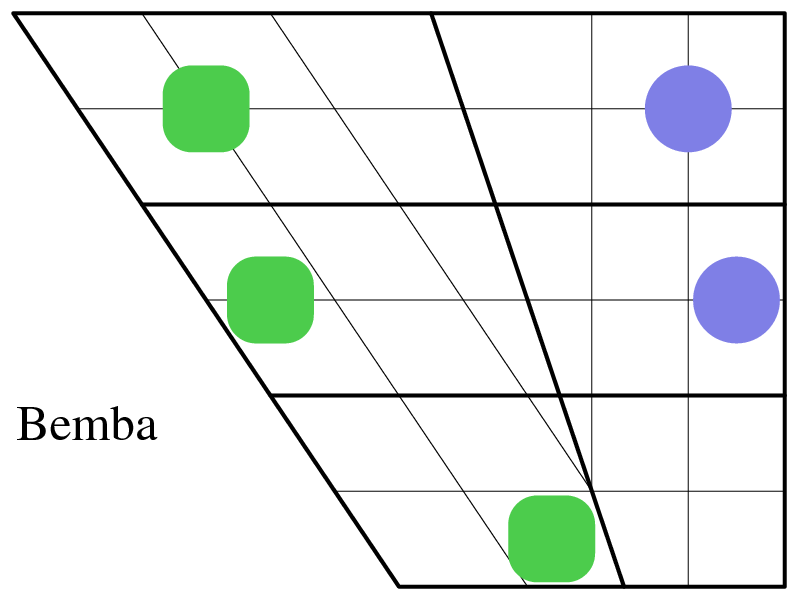 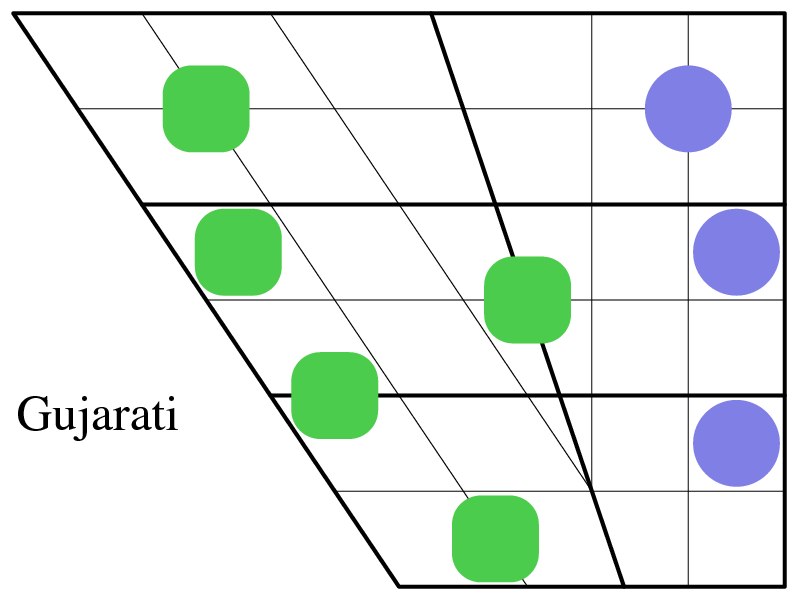 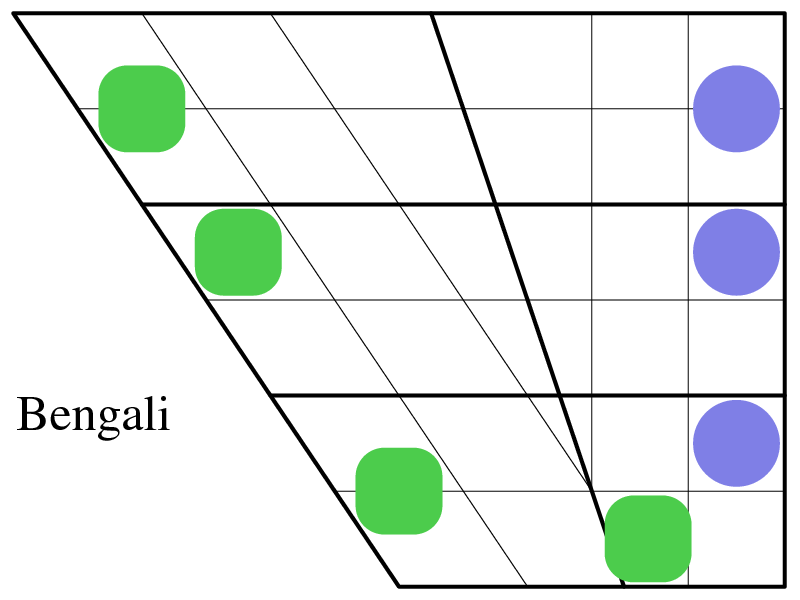 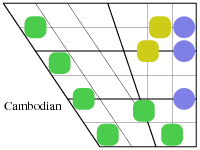 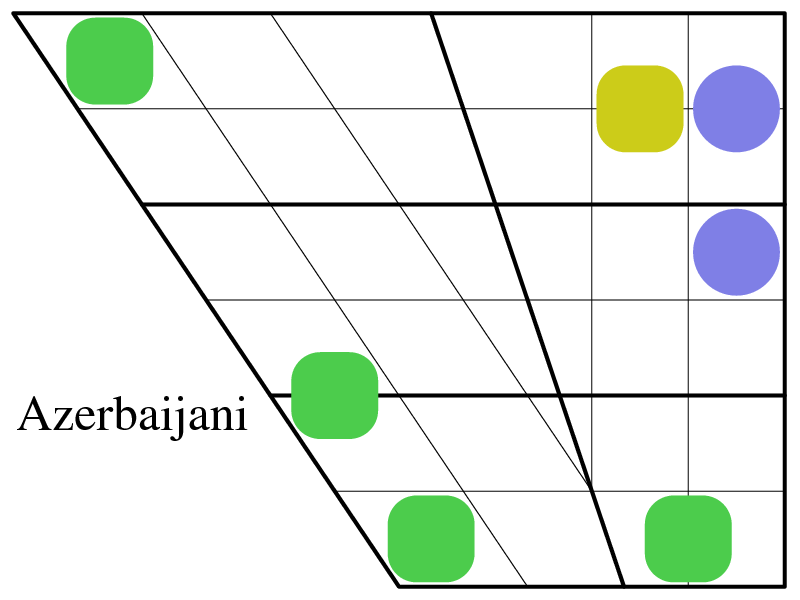 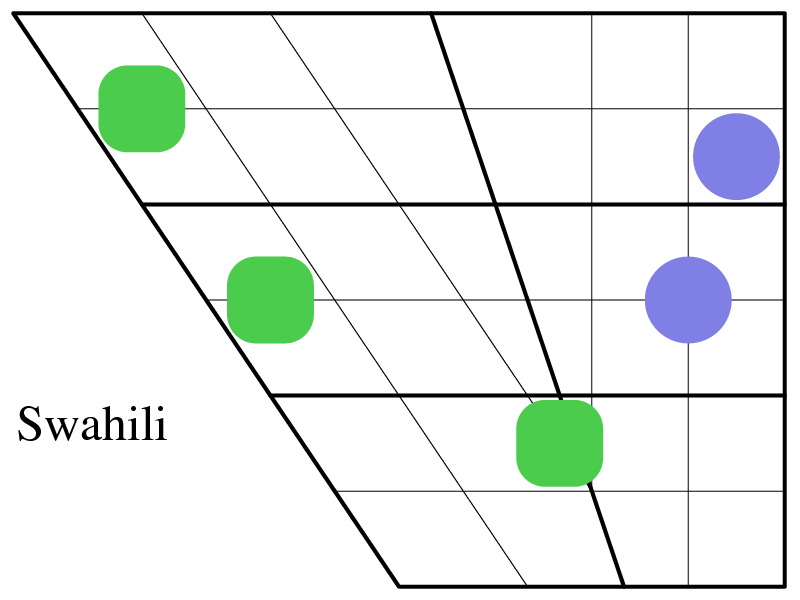 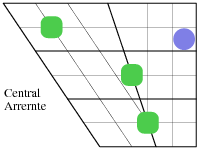 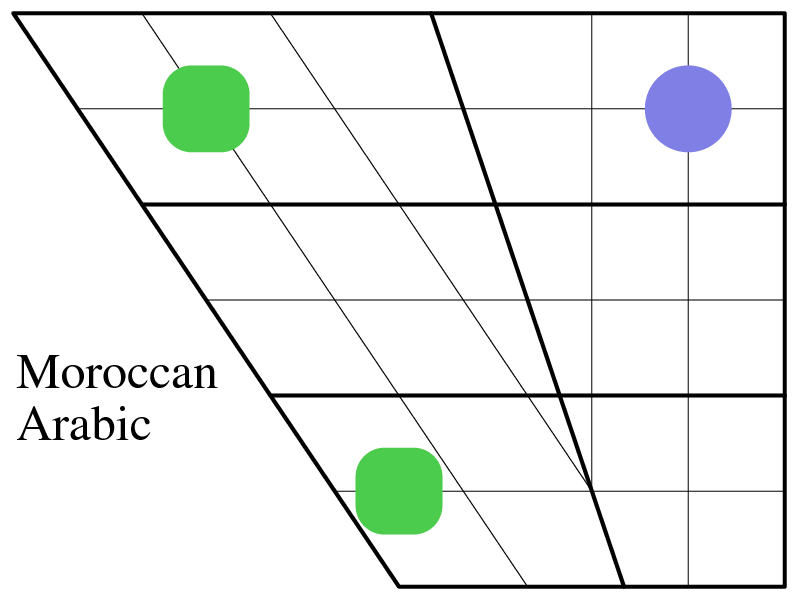 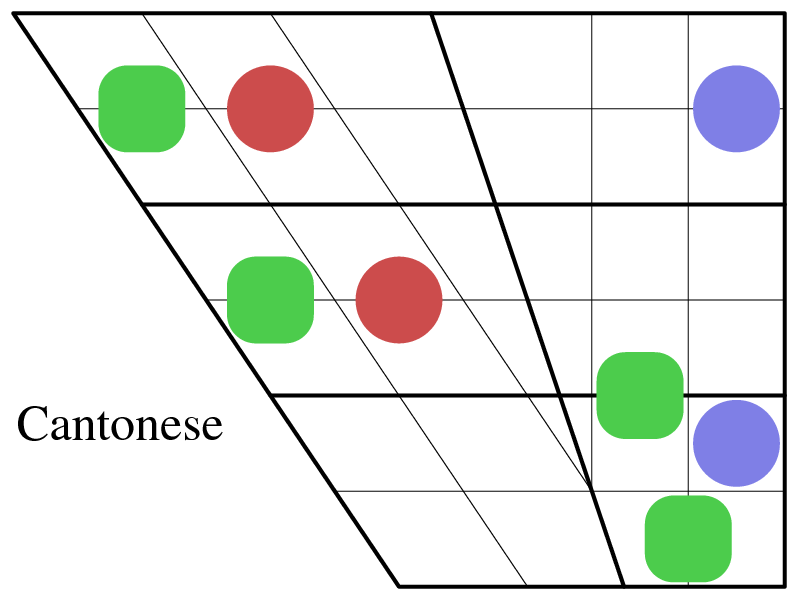 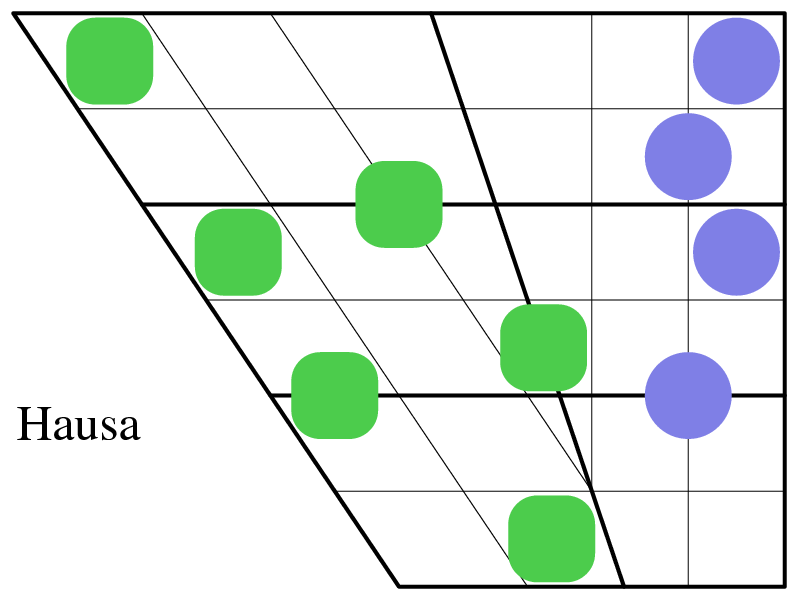 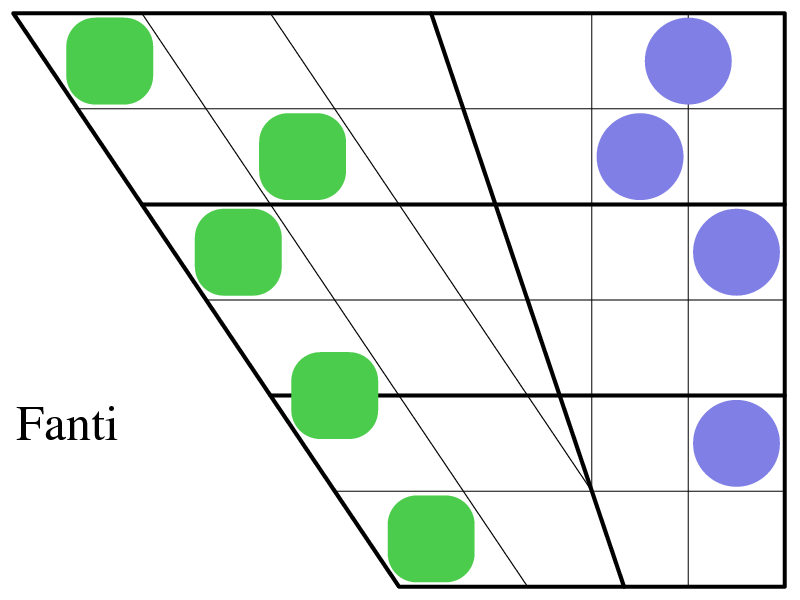 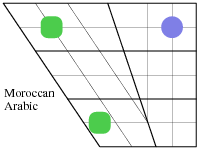 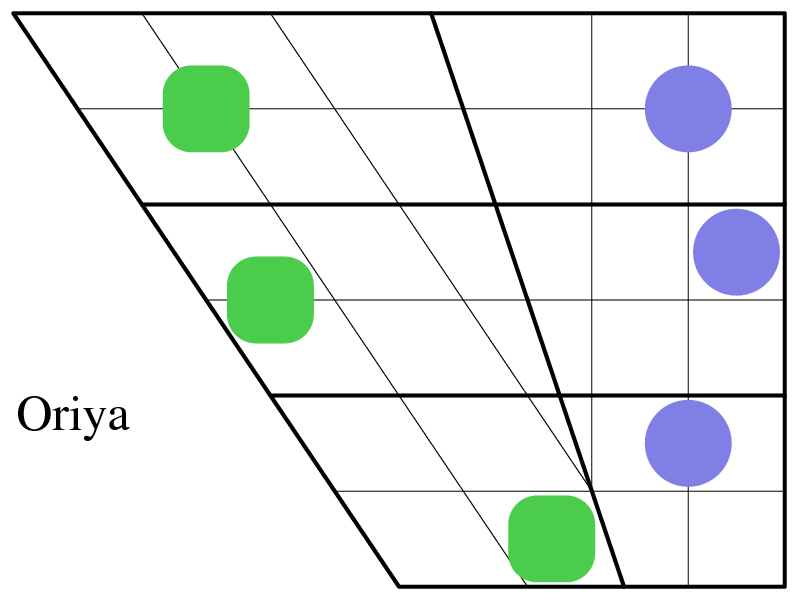 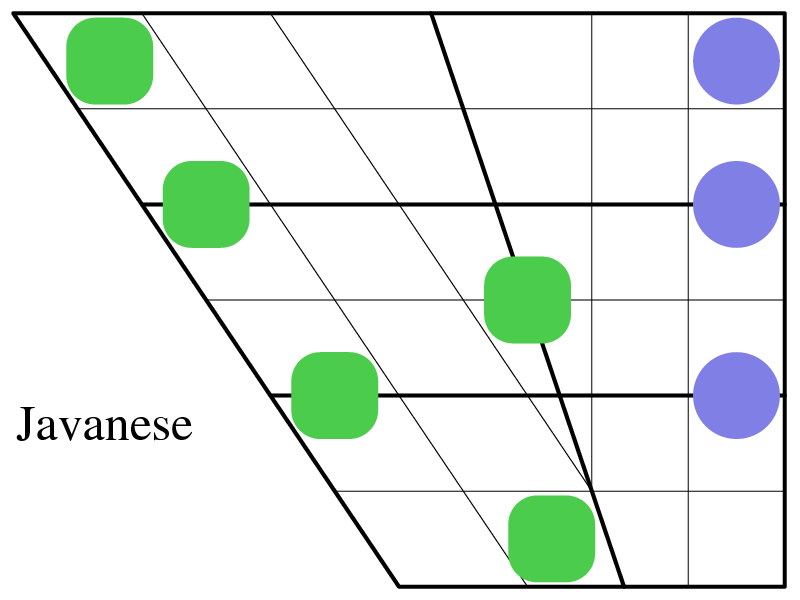 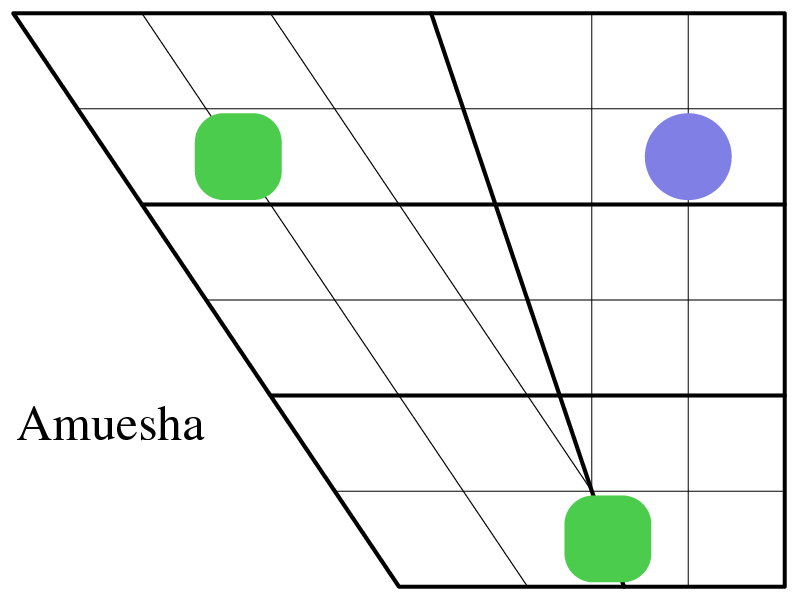 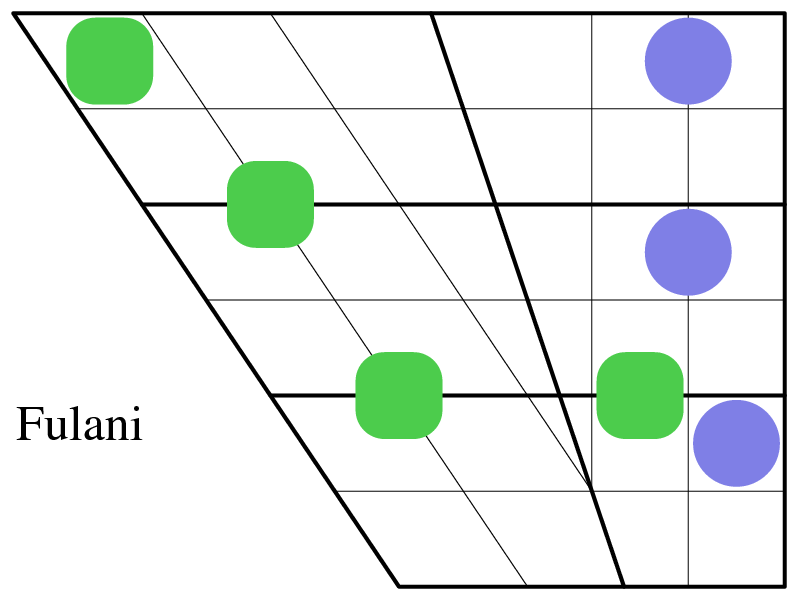 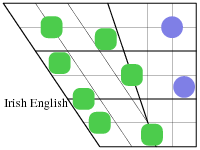 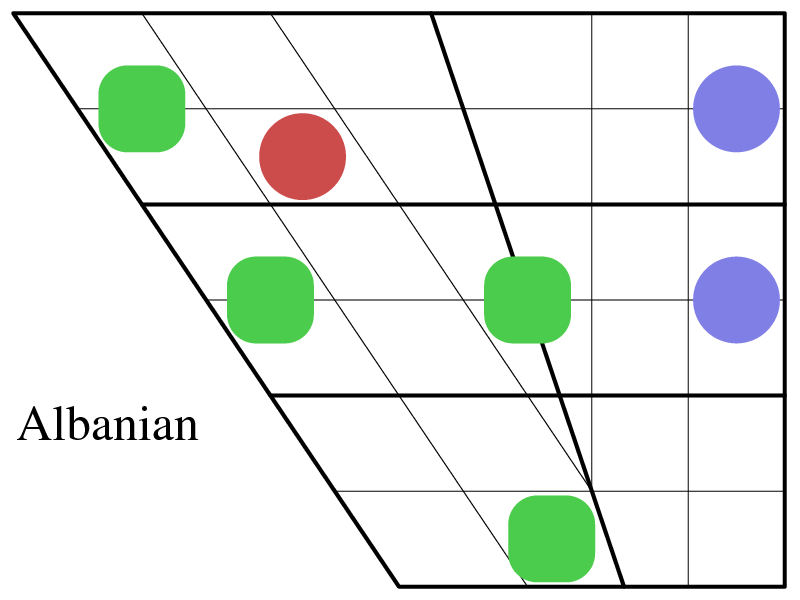 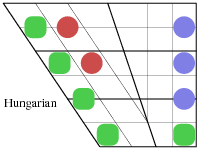 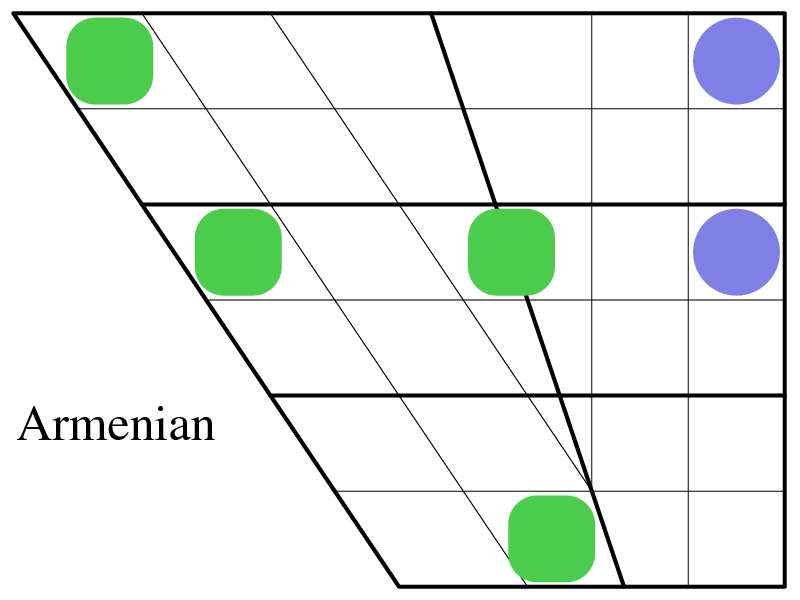 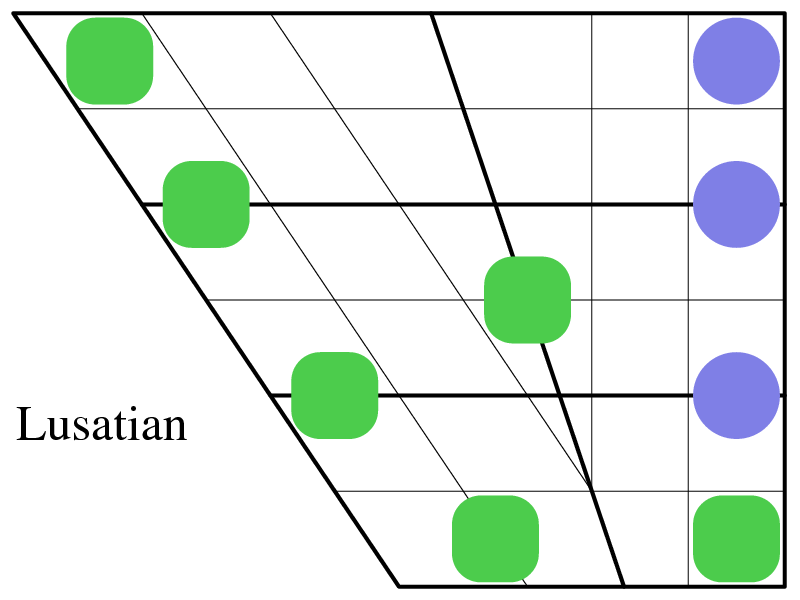 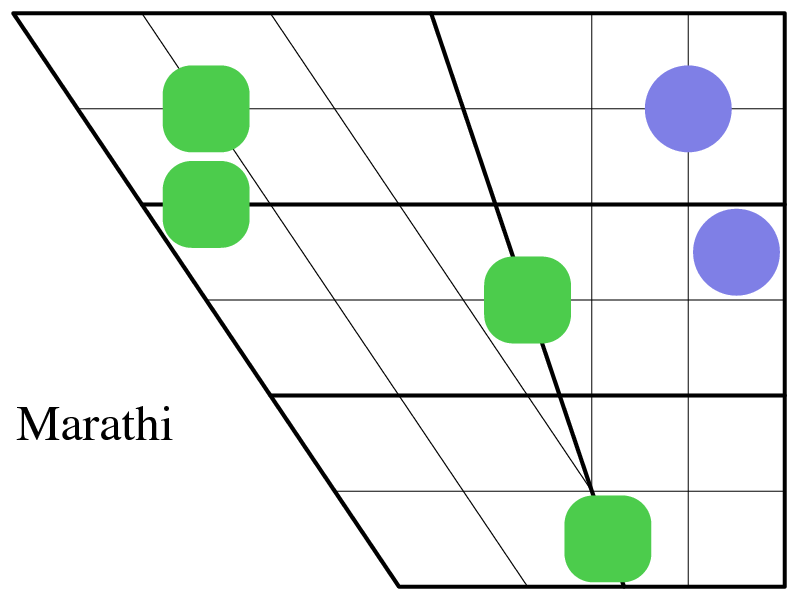 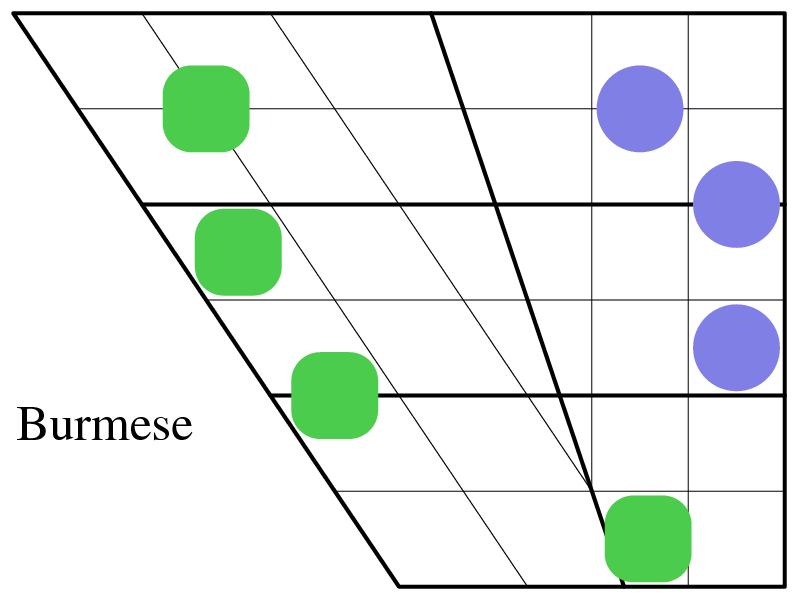 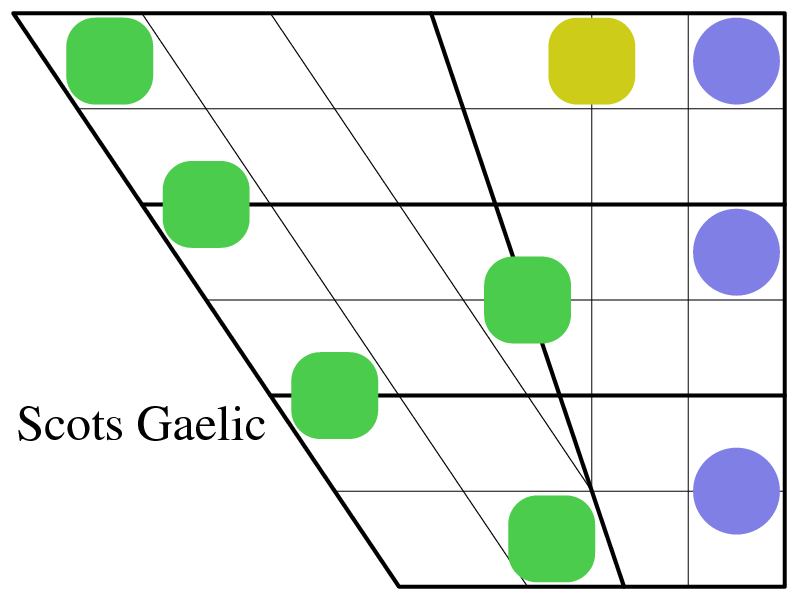 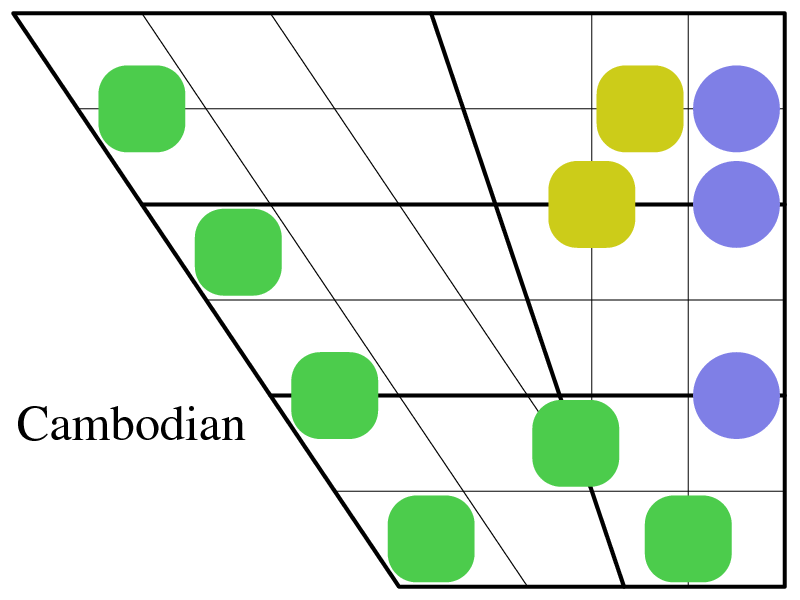 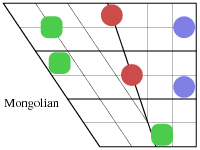 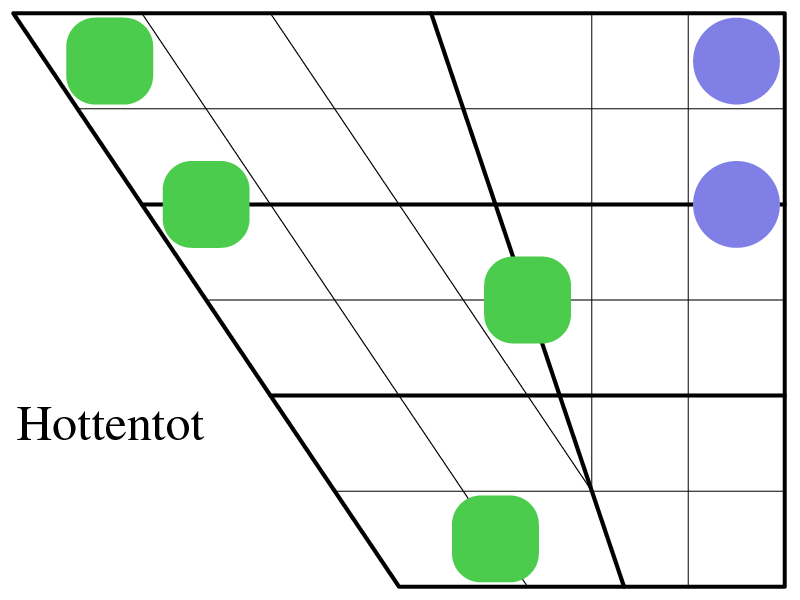 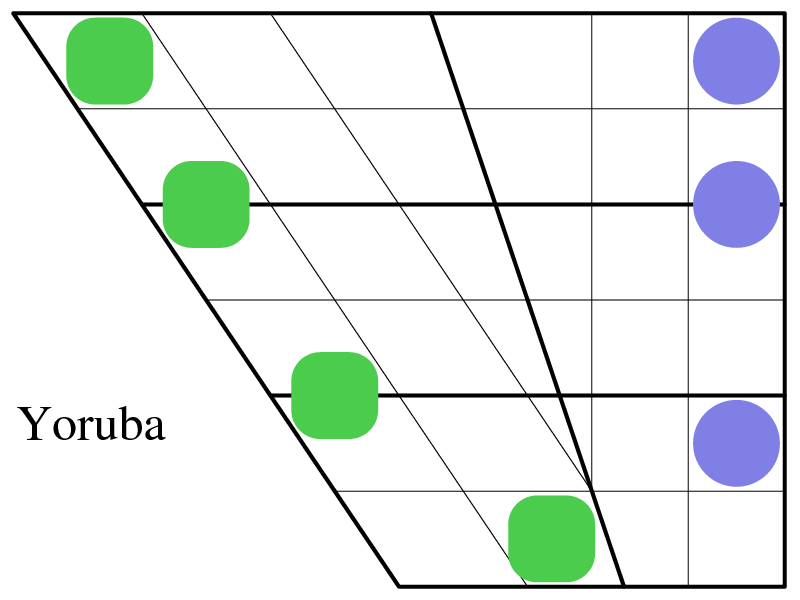 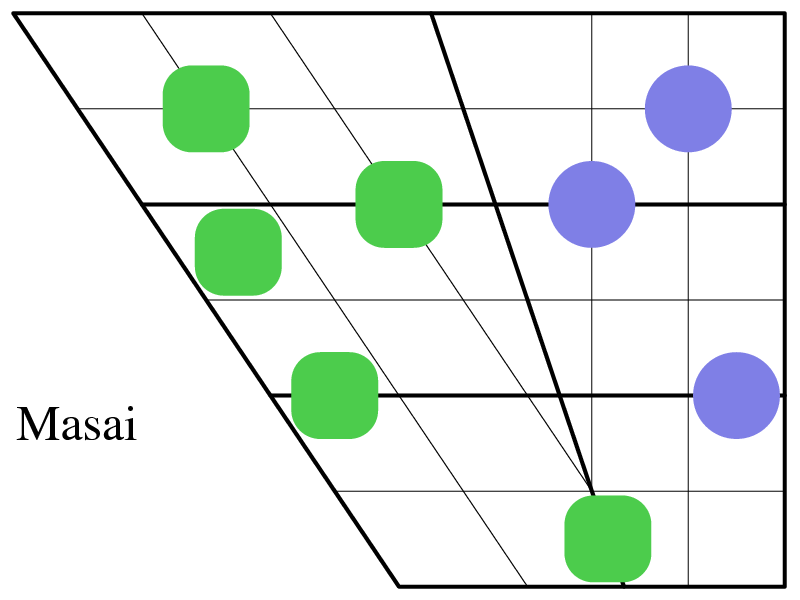 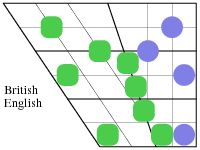 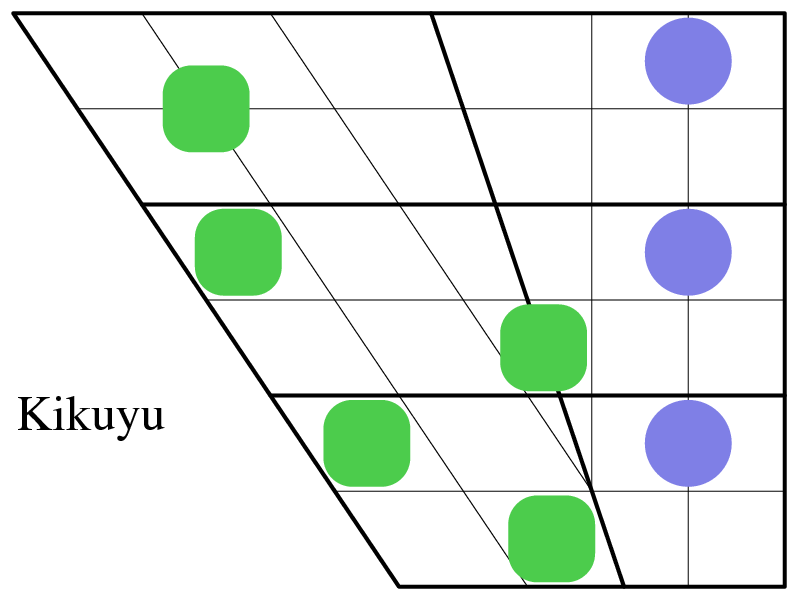 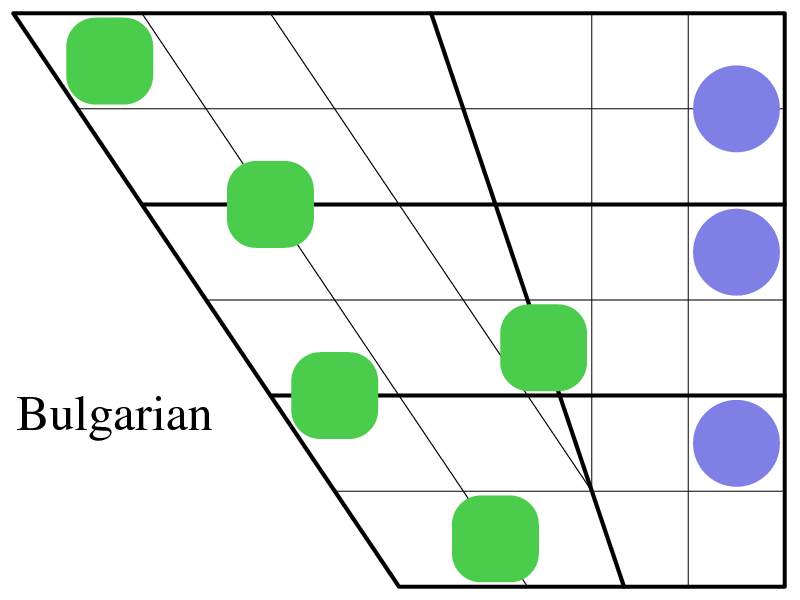 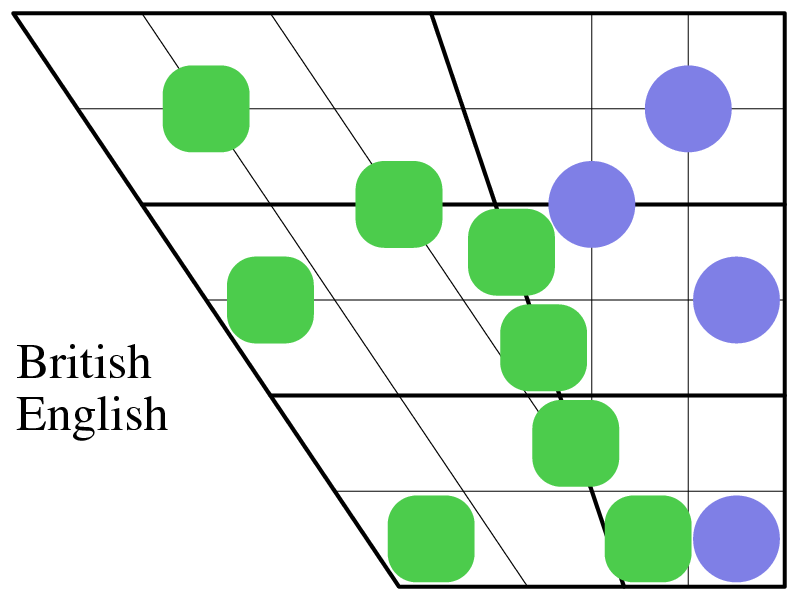 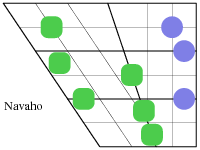 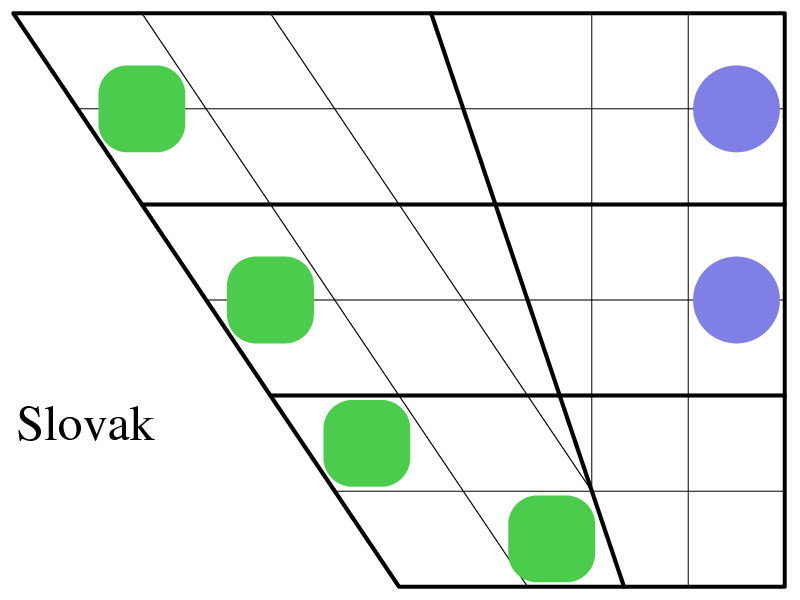 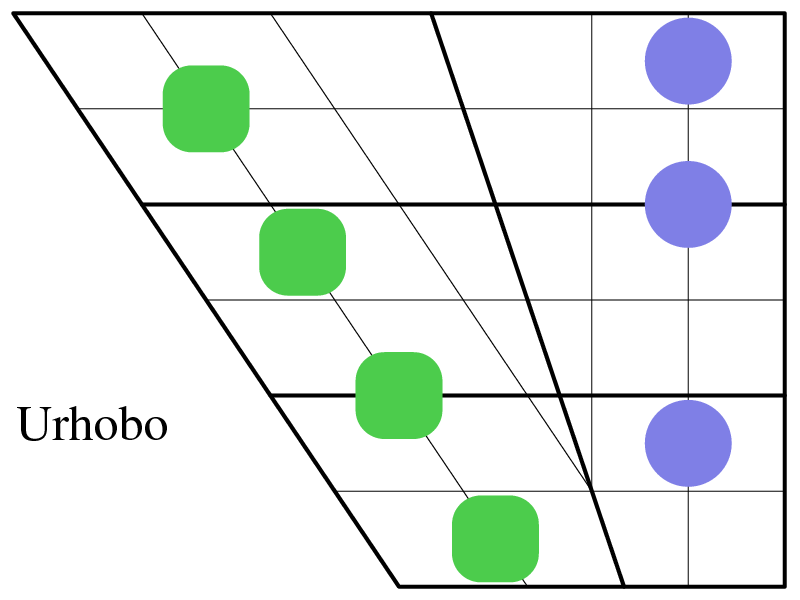 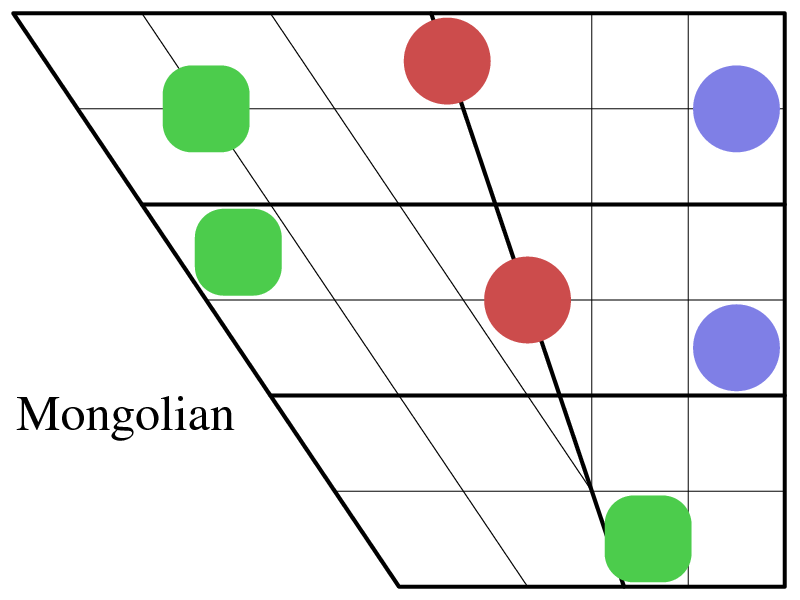 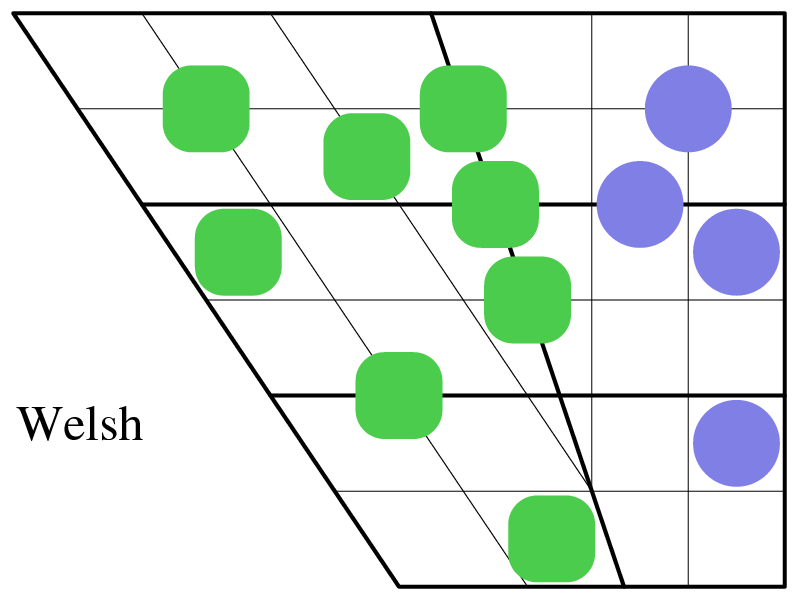 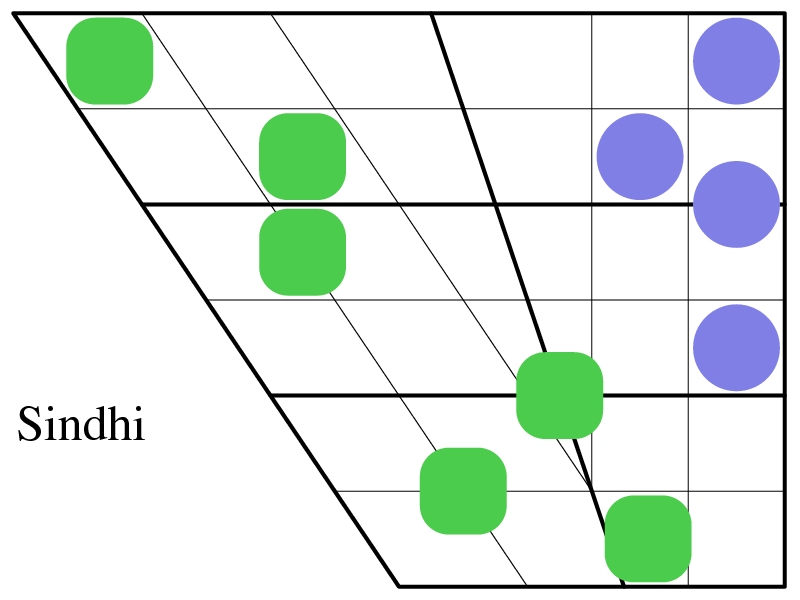 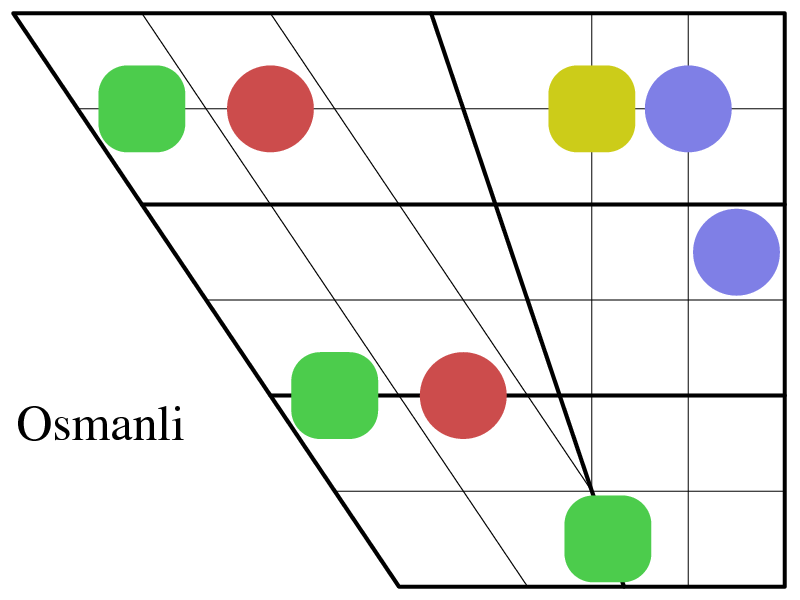 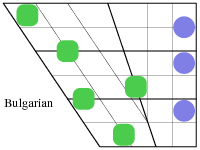 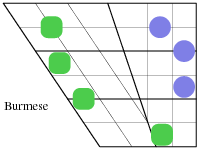 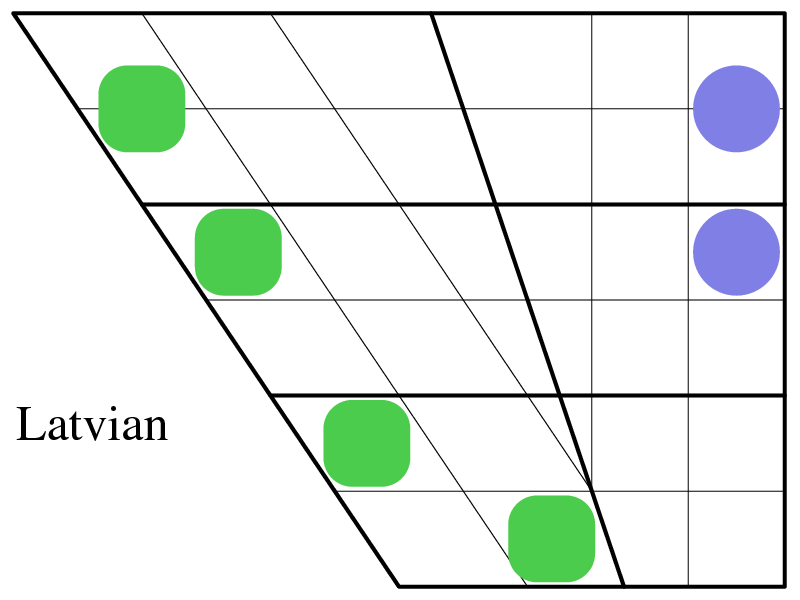 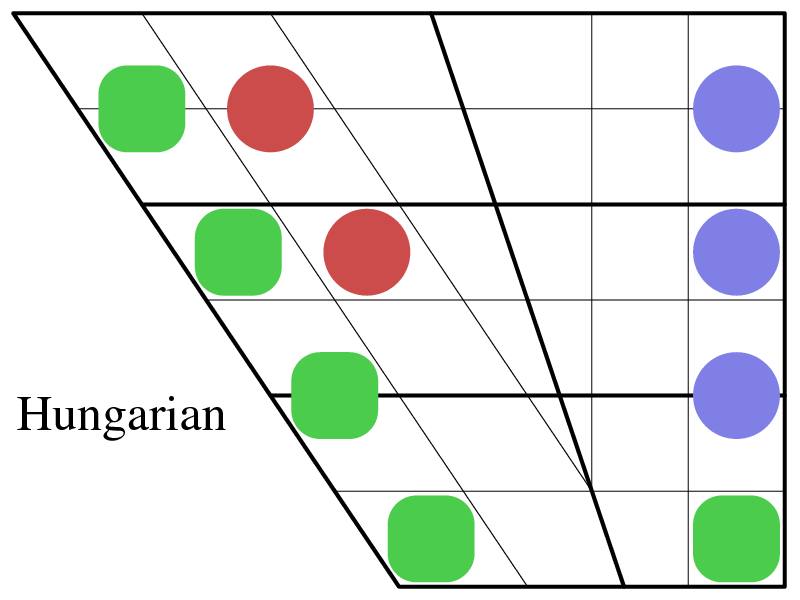 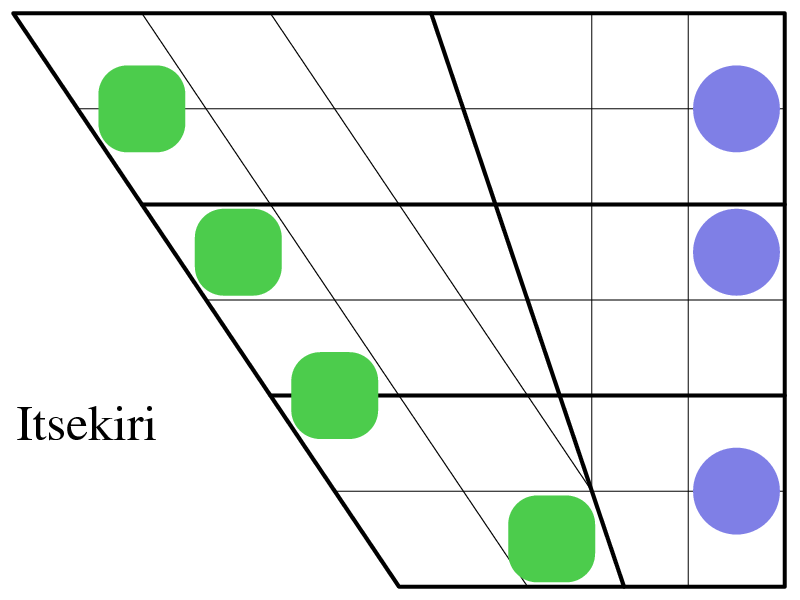 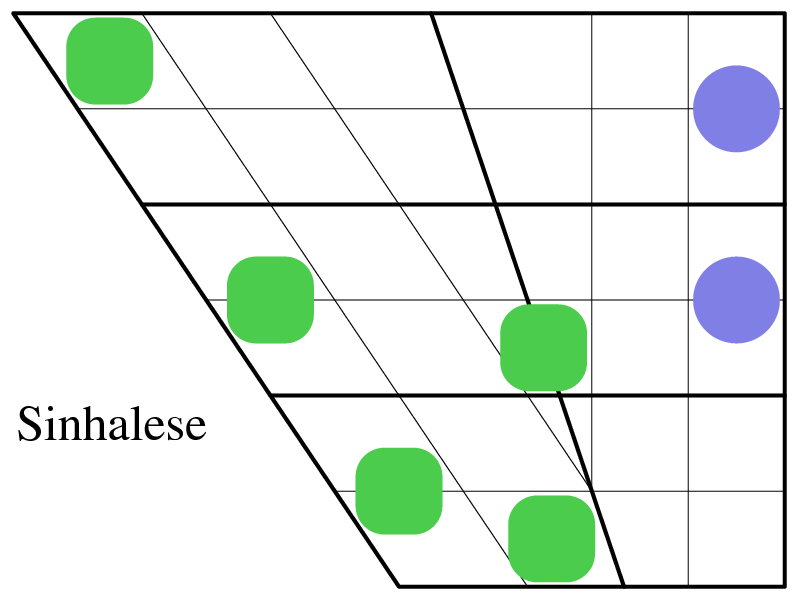 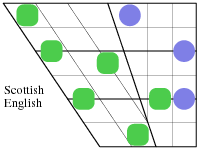 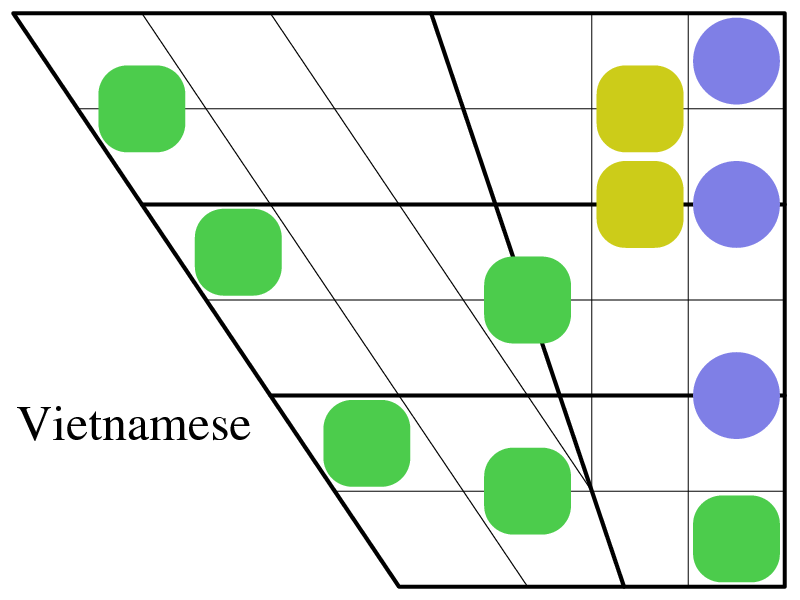 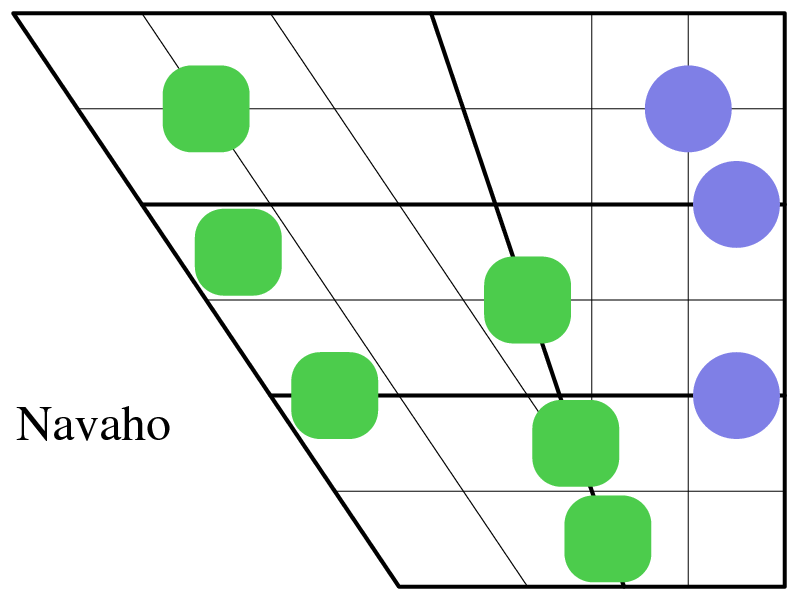 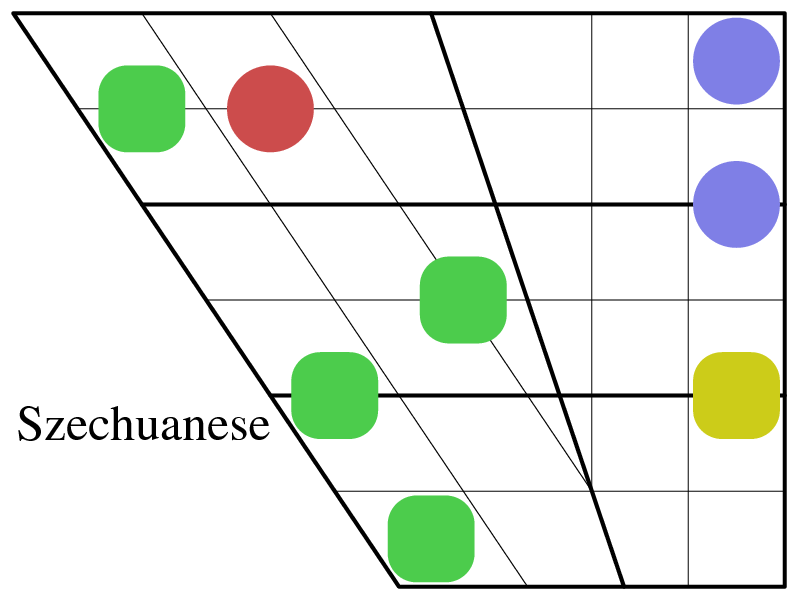 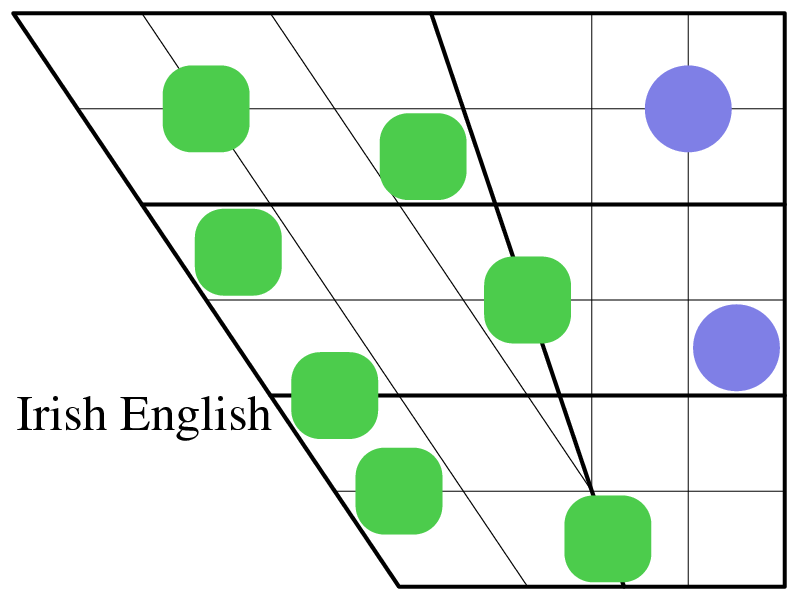 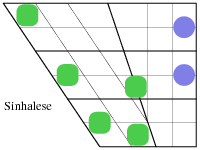 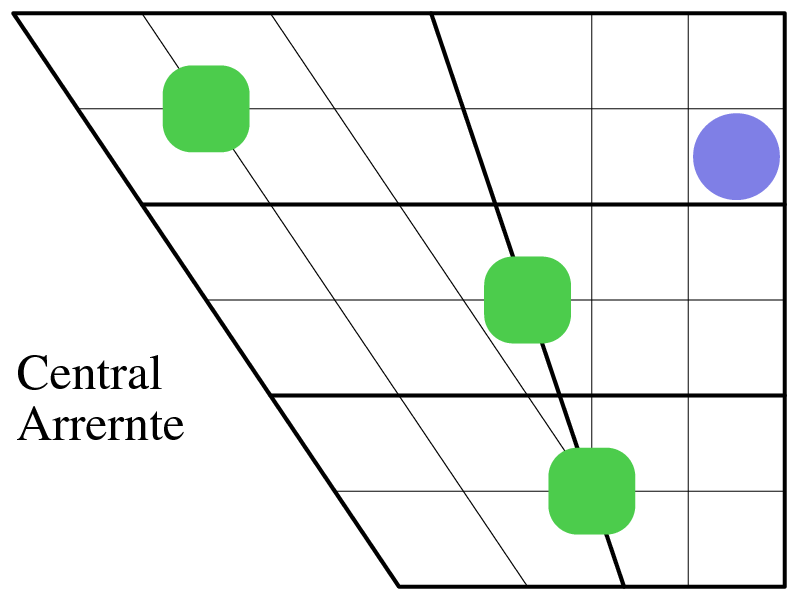 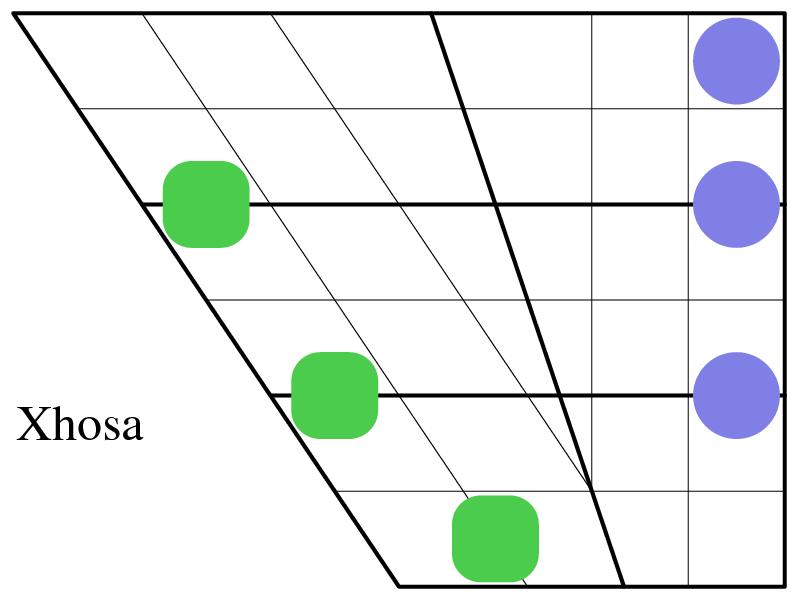 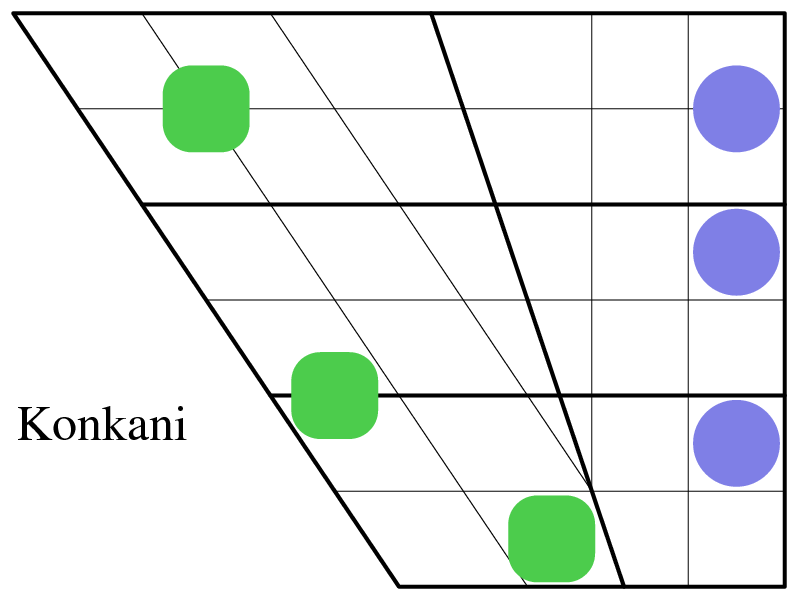 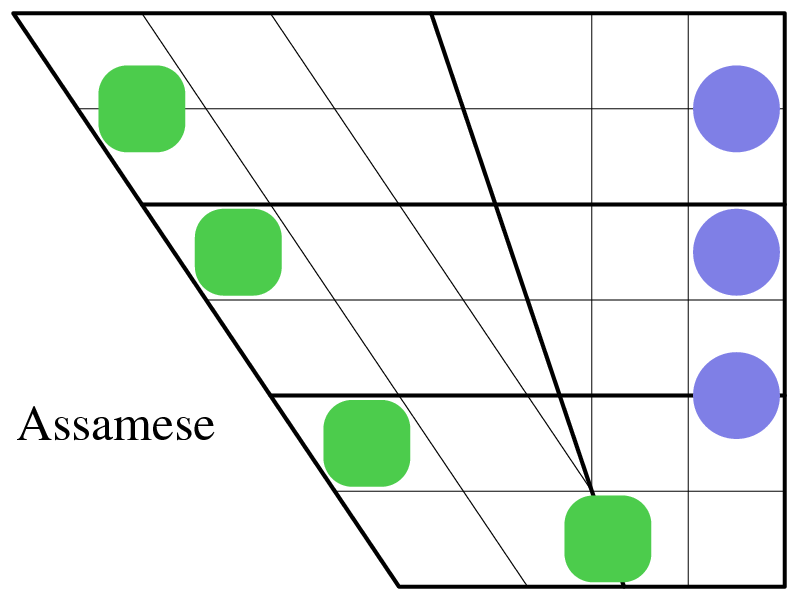 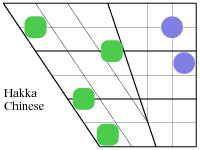 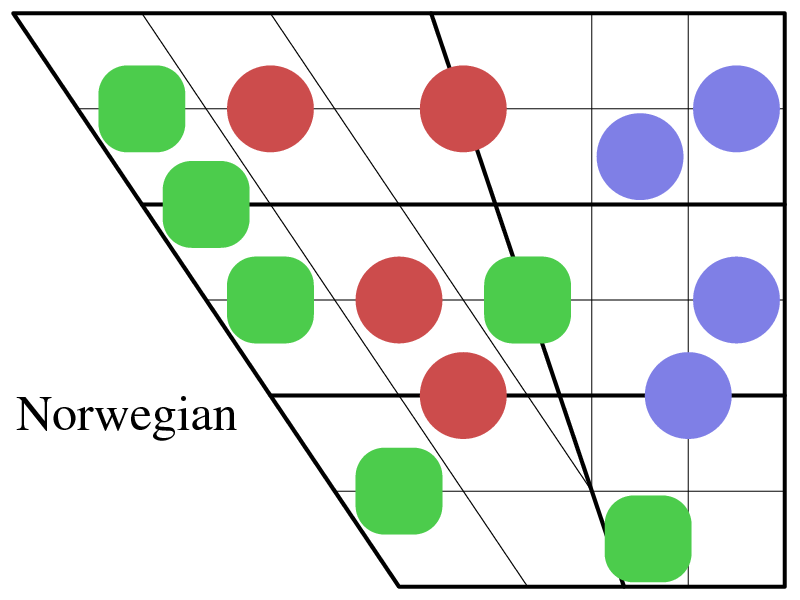 The following diagrams are offered as 132 examples of representations of the basic systems of simple (no diphthongs or nasal vowels) vowel contrasts in a wide variety of languages from many geographical locations all over the world. 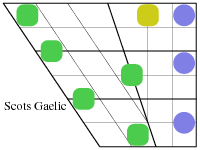 In almost every case there is no question of their being based on observations of the languages by the compiler who has merely used various sources available in the phonetic literature. 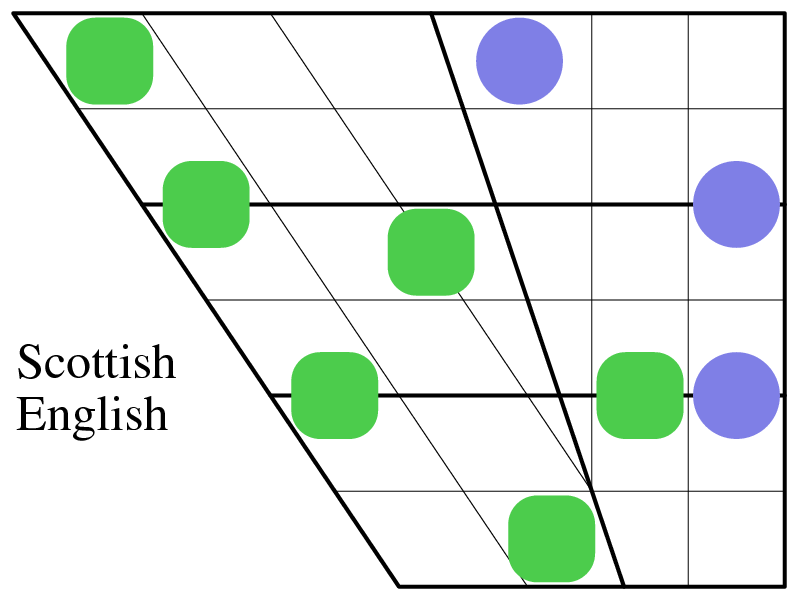 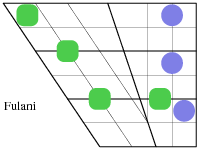 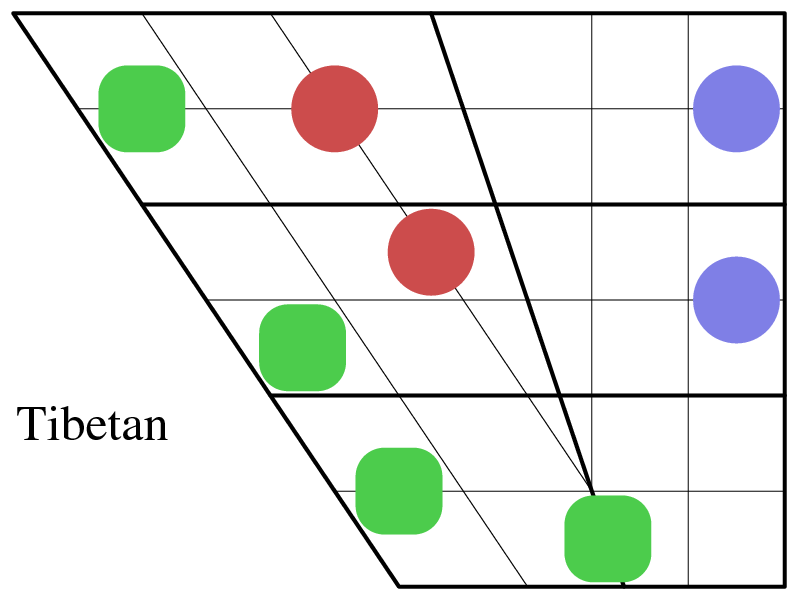 The diagram form used is that currently recognised by the International Phonetic Association but with the addition in feint form intermediately of three extra horizontal lines and four others so that a grid is presented as a guide to the eye of approximately 30 squares etc. 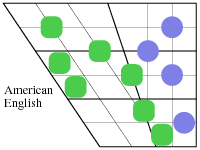 Each vowel is represented by an indicator which is either circular and represents a rounded value or square representing an unrounded value. 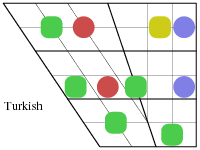 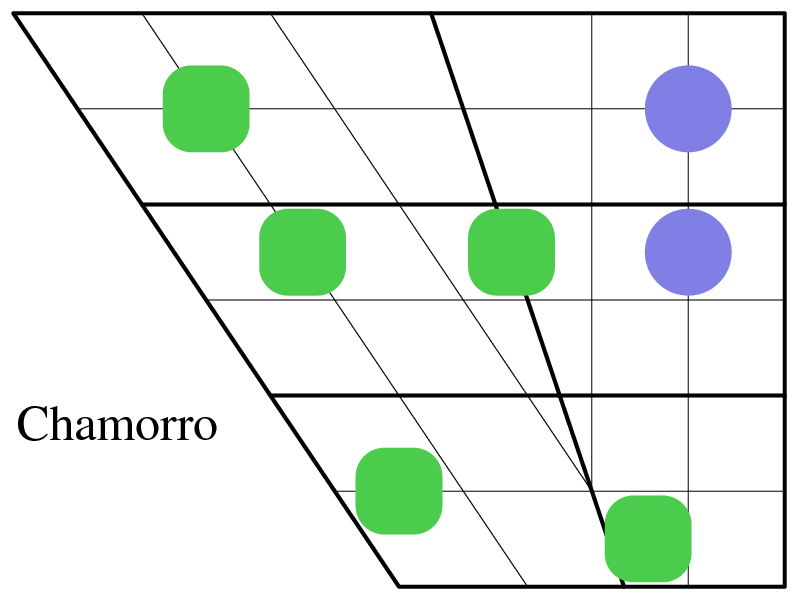 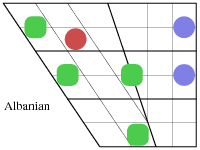 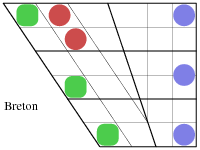 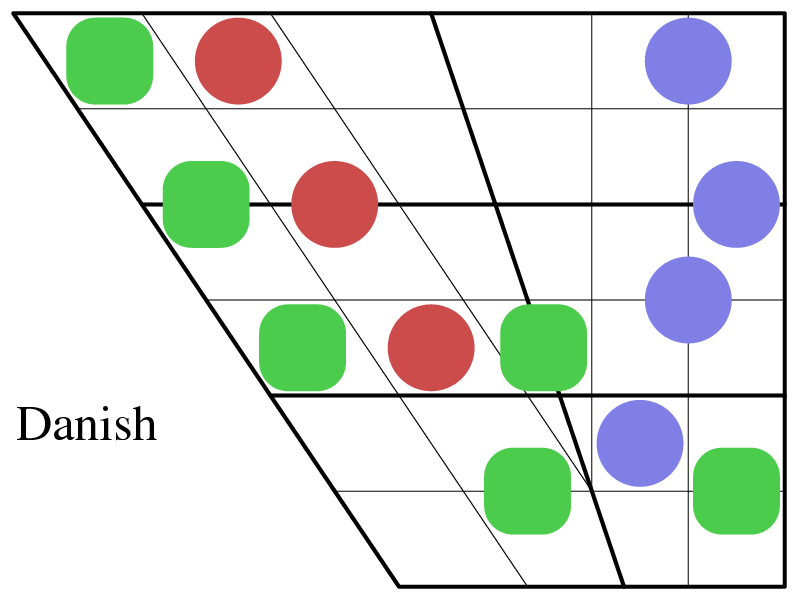 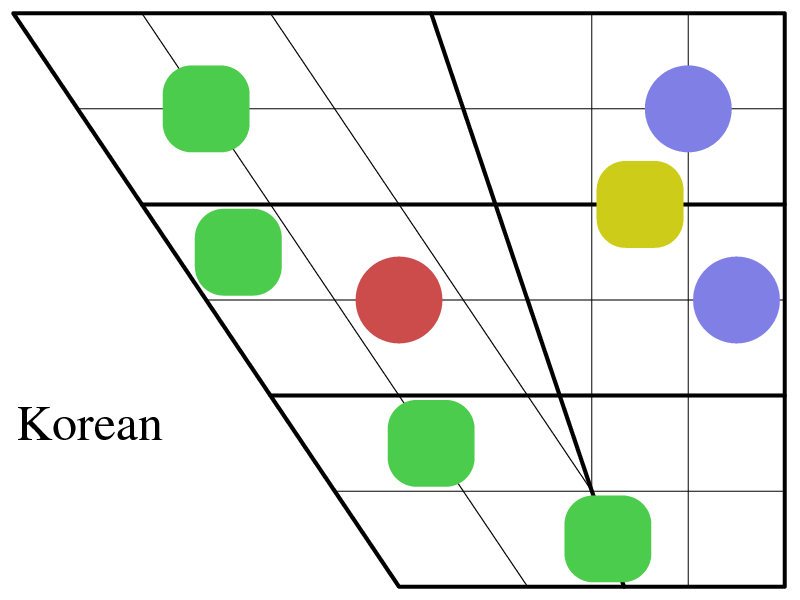 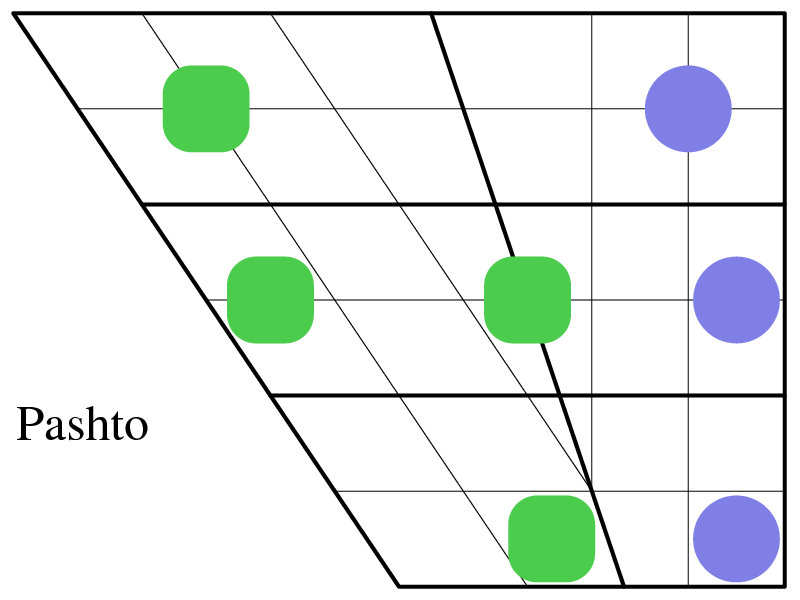 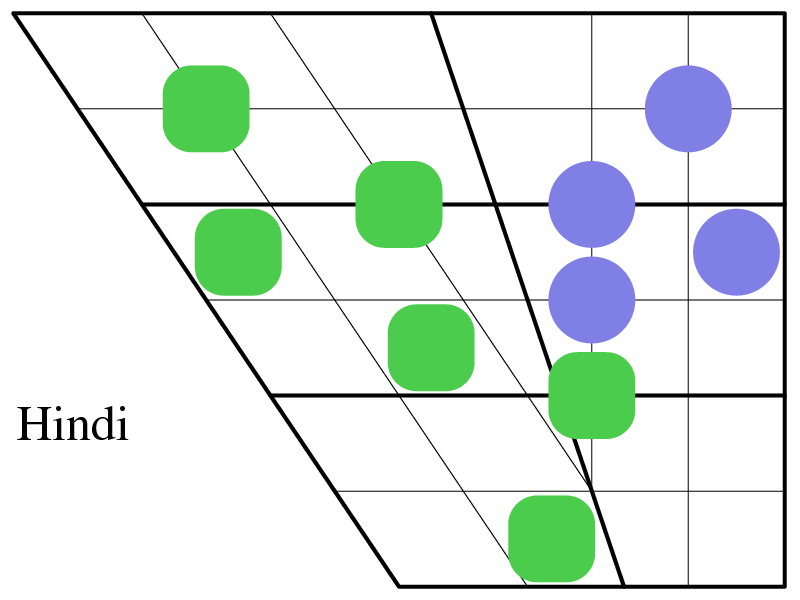 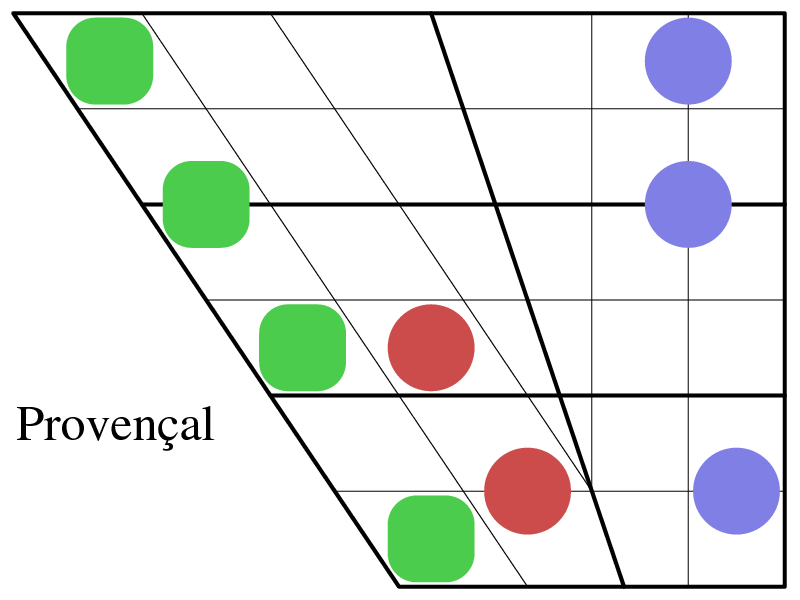 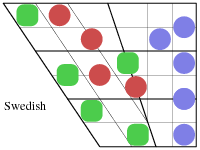 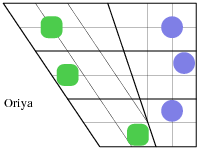 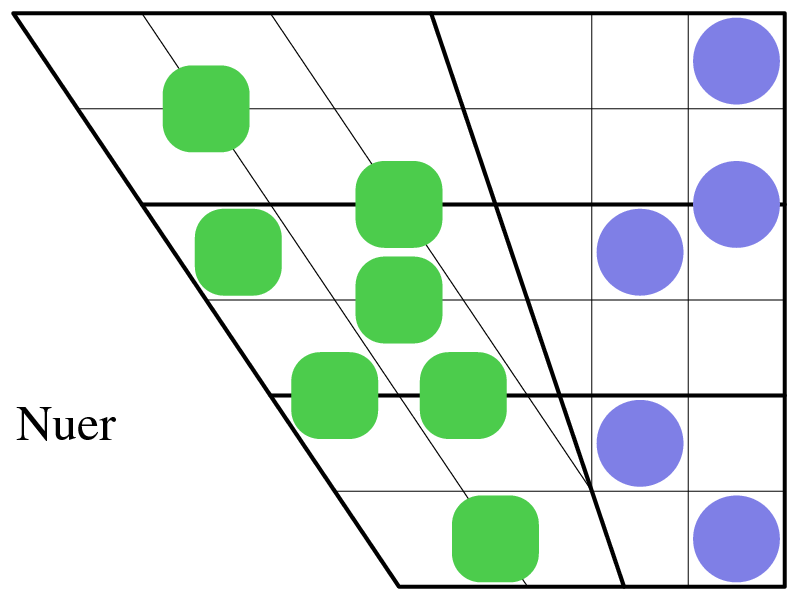 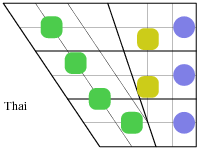 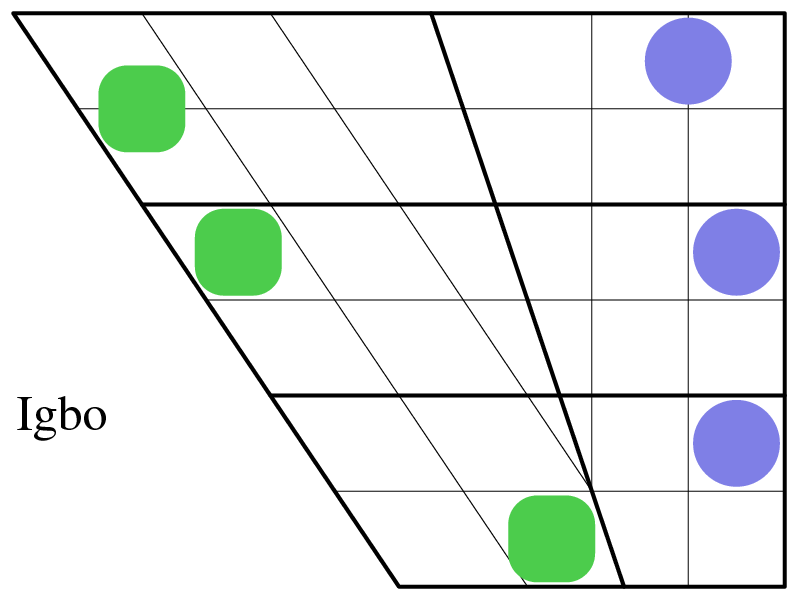 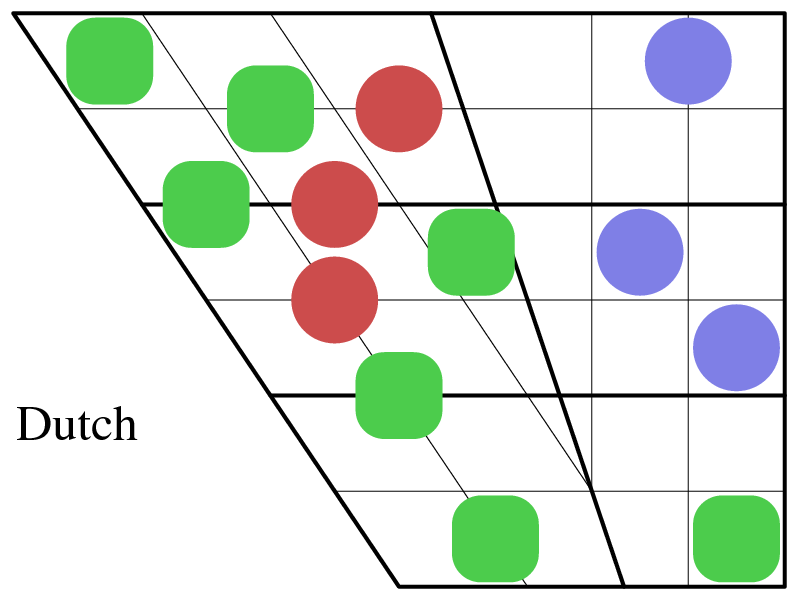 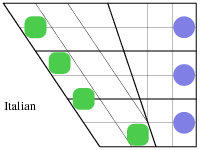 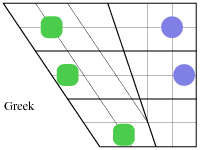 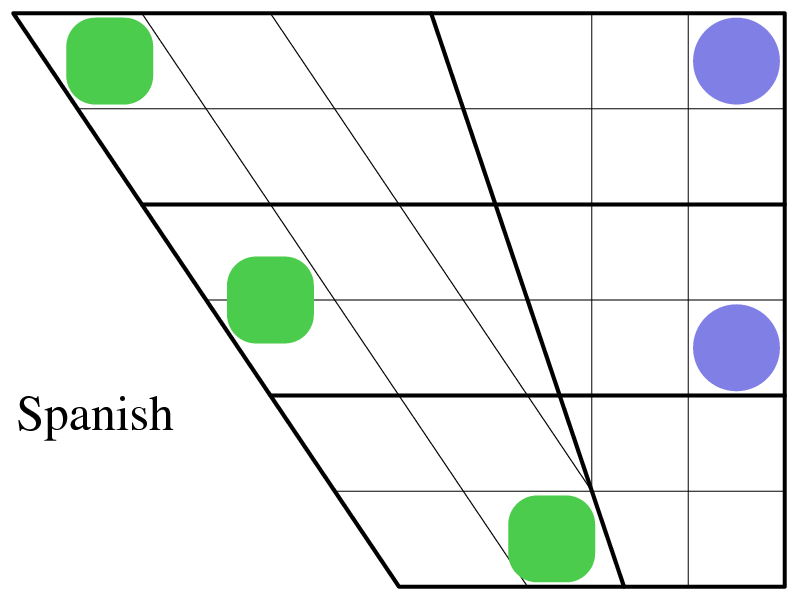 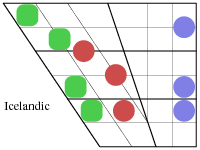 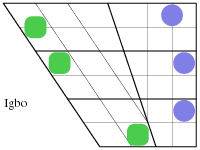 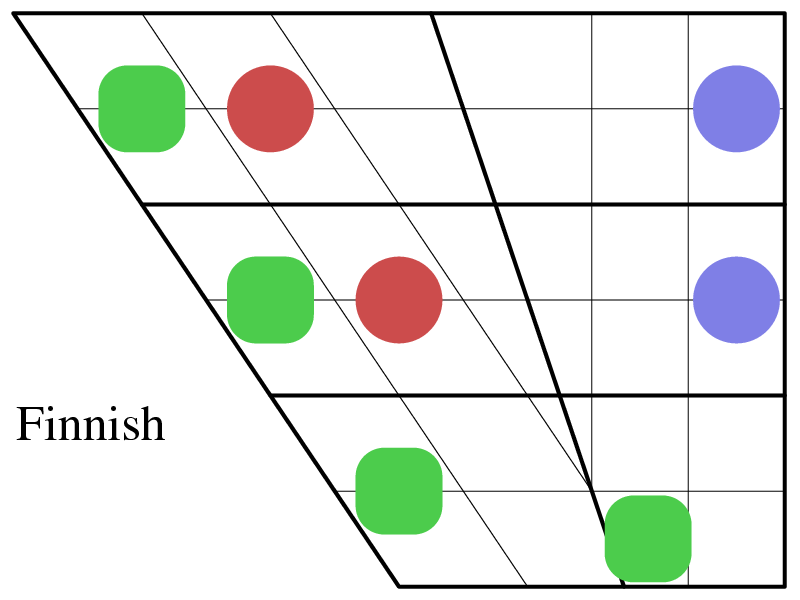 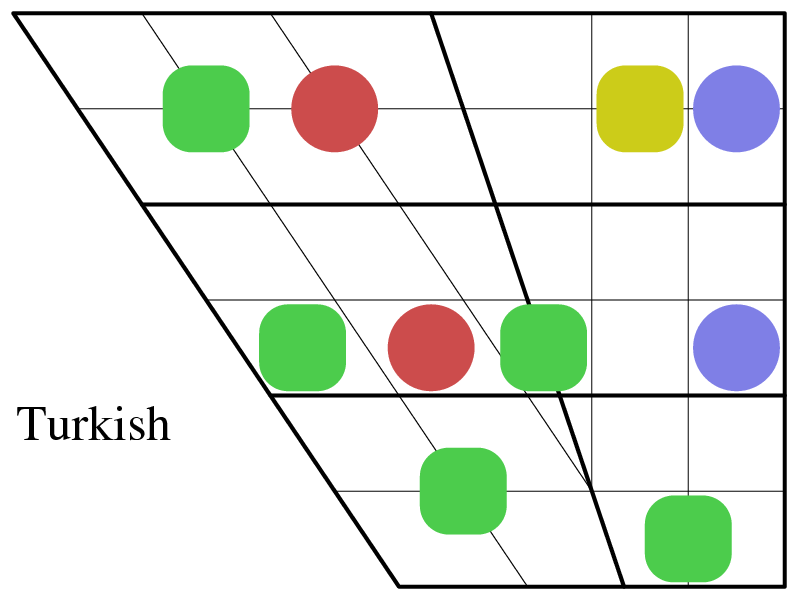 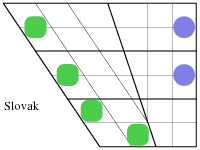 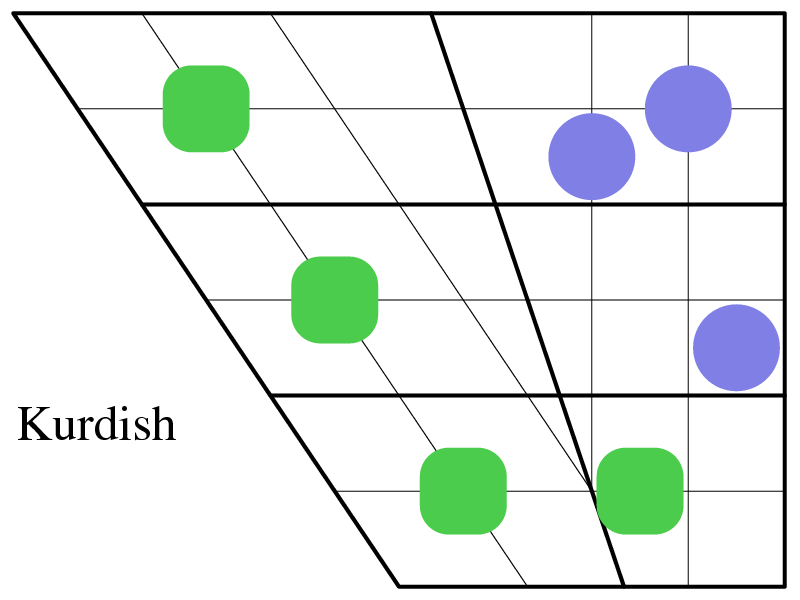 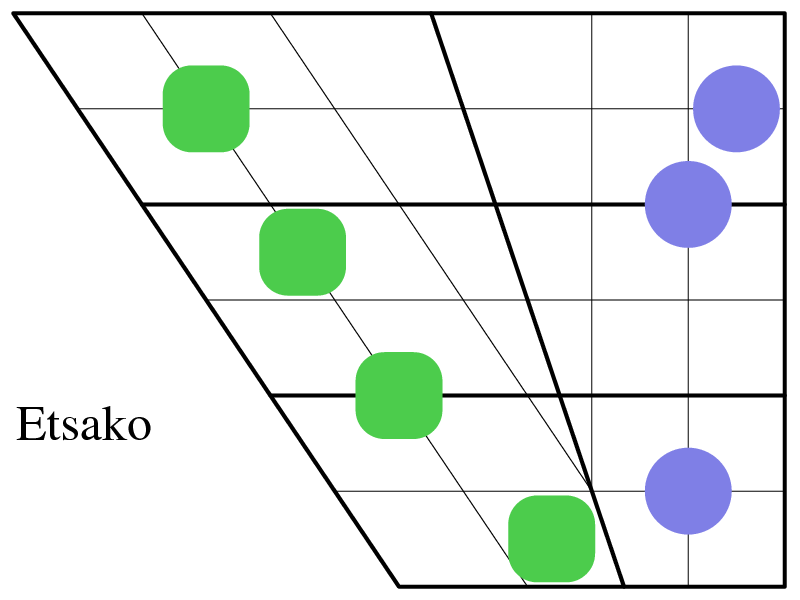 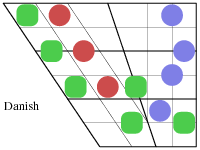 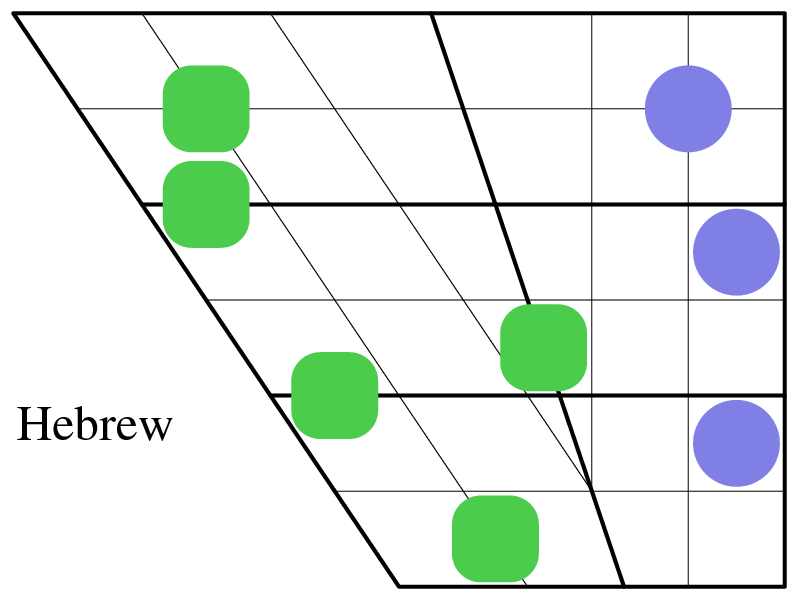 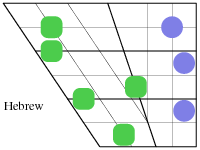 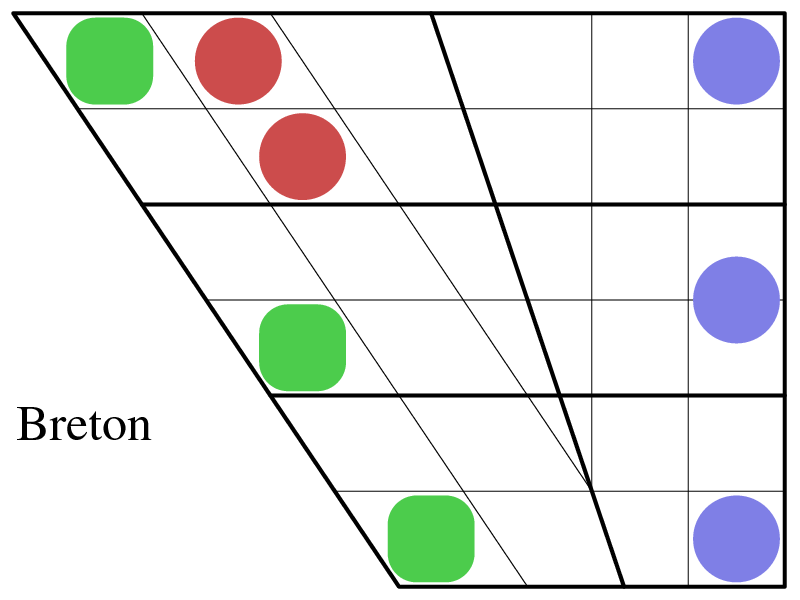 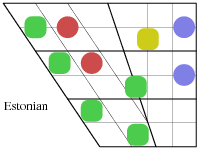 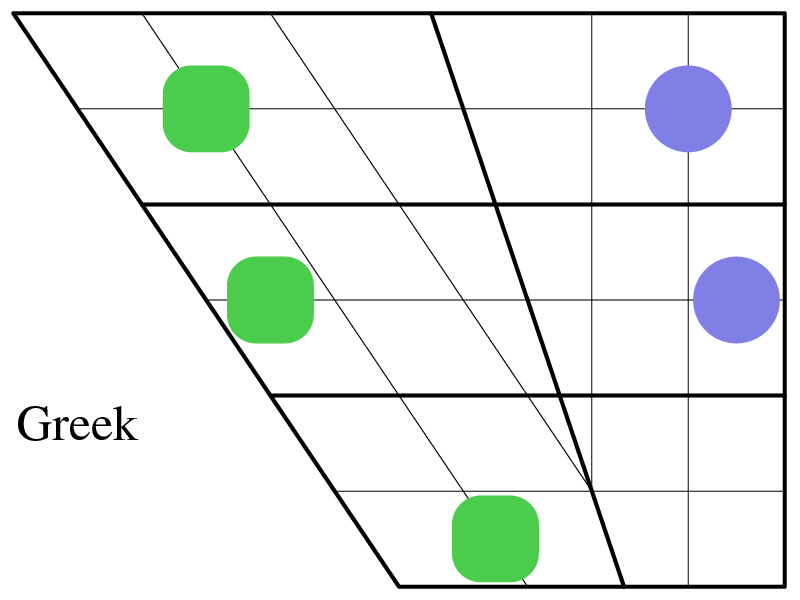 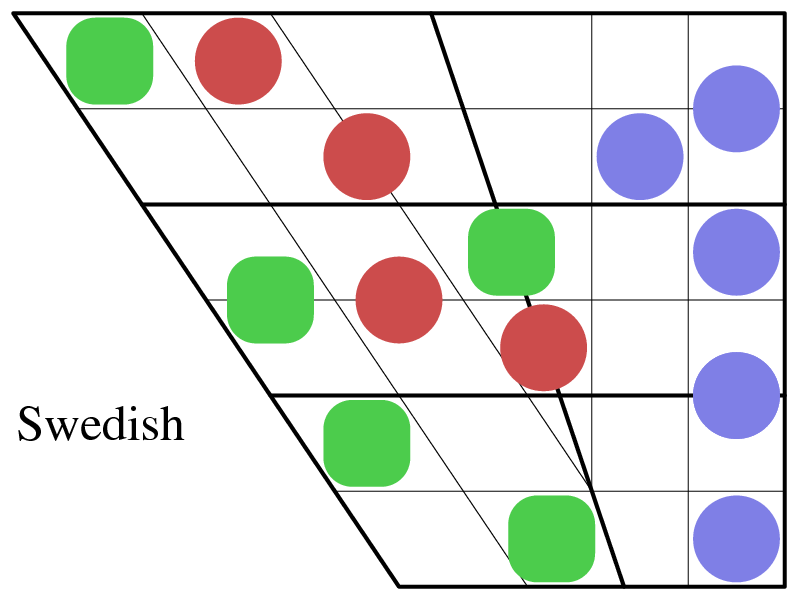 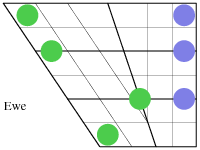 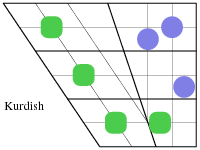 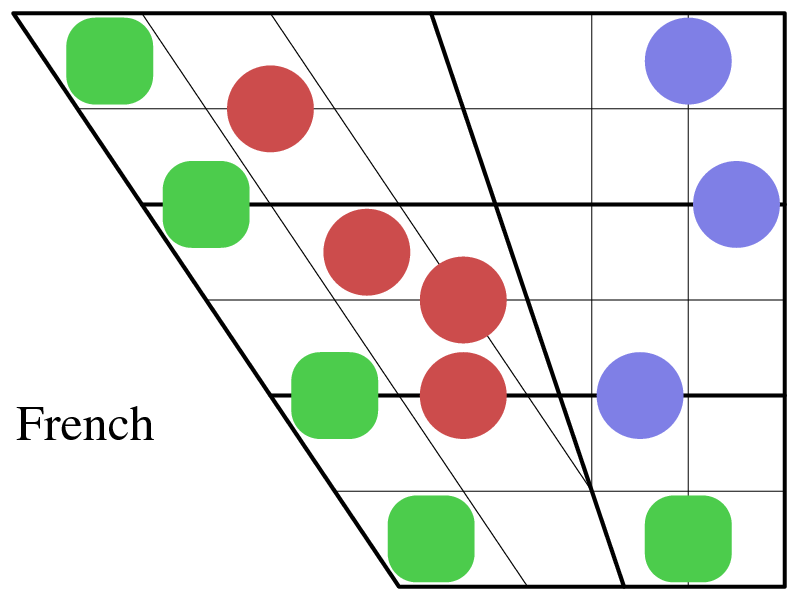 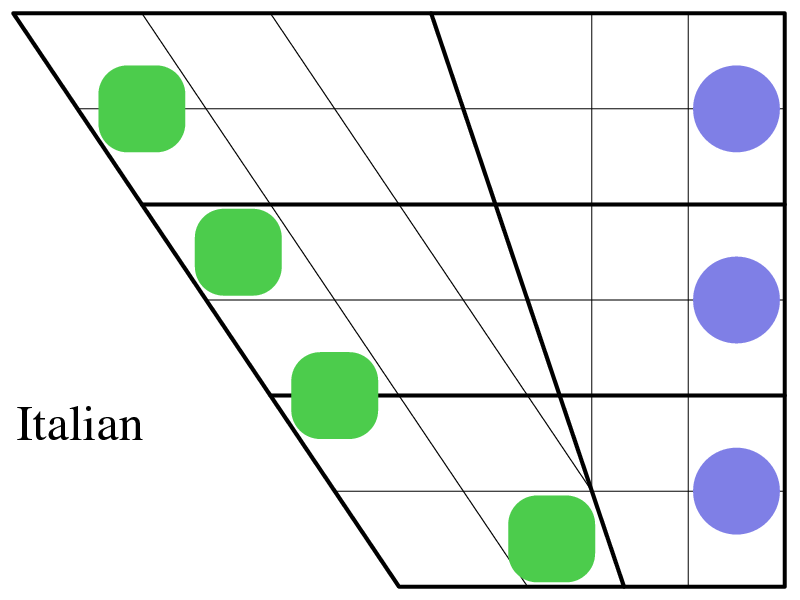 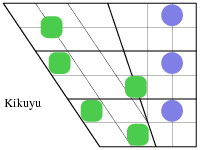 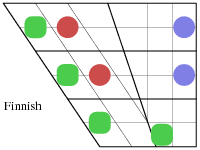 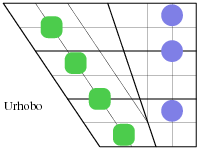 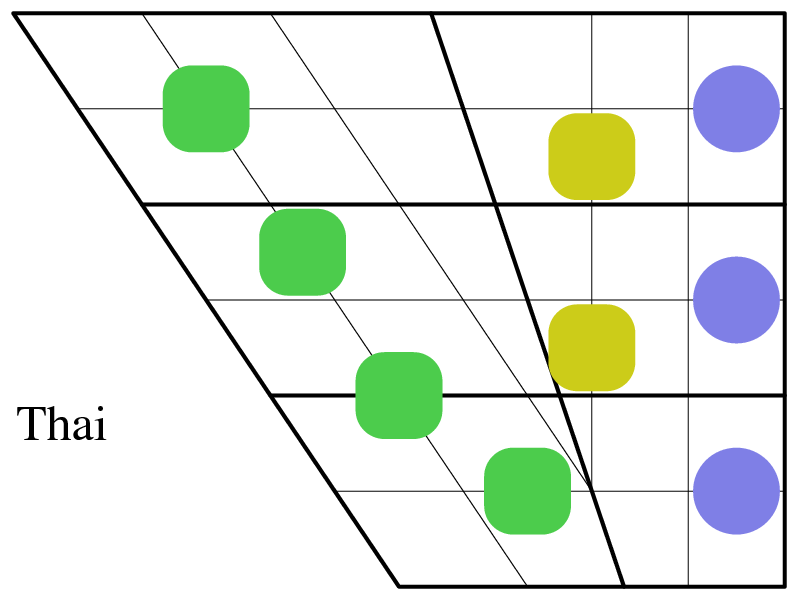 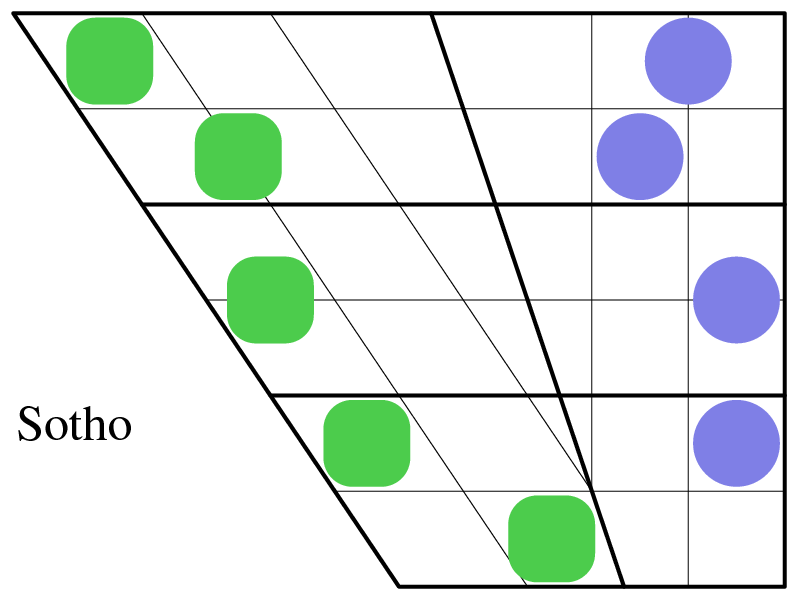 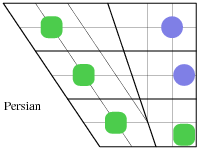 The indicator for each front unrounded vowel and each open-mid or more open back unrounded back vowel is green and for each front rounded one is red; that for each back rounded vowel is blue and for each back unrounded vowel closer than open-mid is yellow. 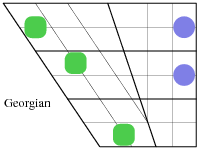 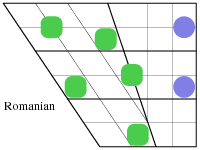 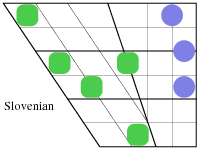 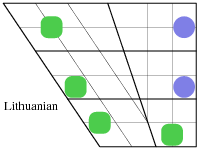 The explanation for the irregularity just mentioned has been neatly put by Professor John Wells in his phonetic blog of Saturday 1 July 2006 which commented on these diagrams saying "Vowels of the [ɑ] type are sensibly treated as systemically front, even if phonetically back, so shown in green". 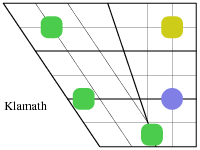 All indicators are the same size ie about one thirtieth of the total area of the diagram. 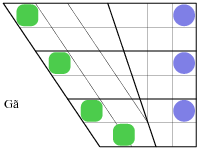 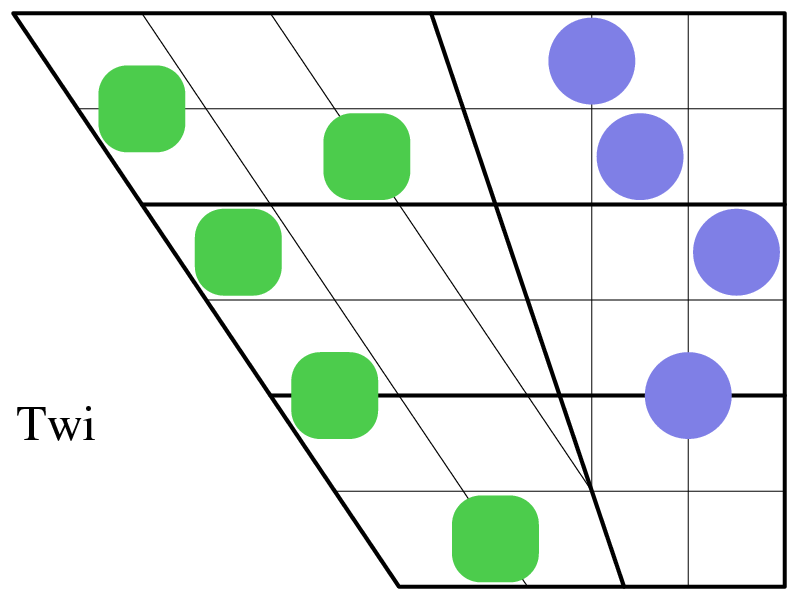 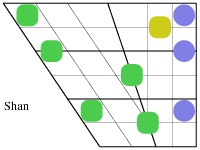 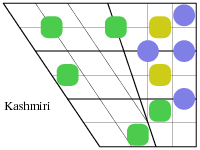 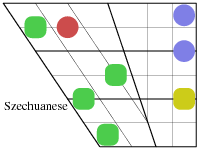 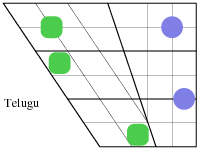 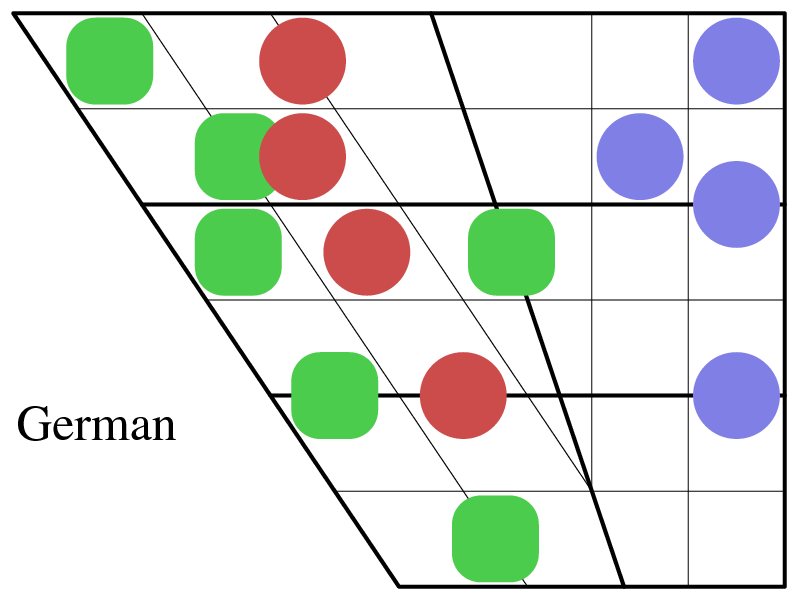 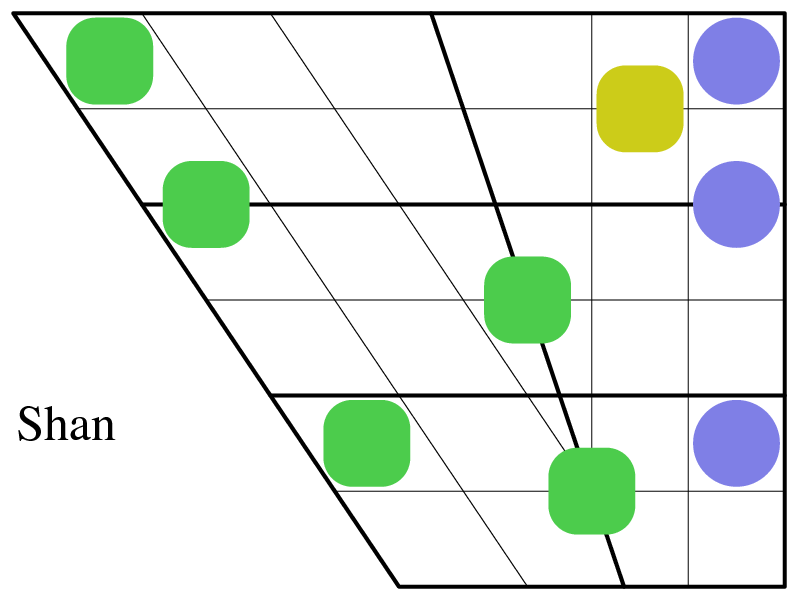 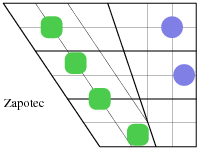 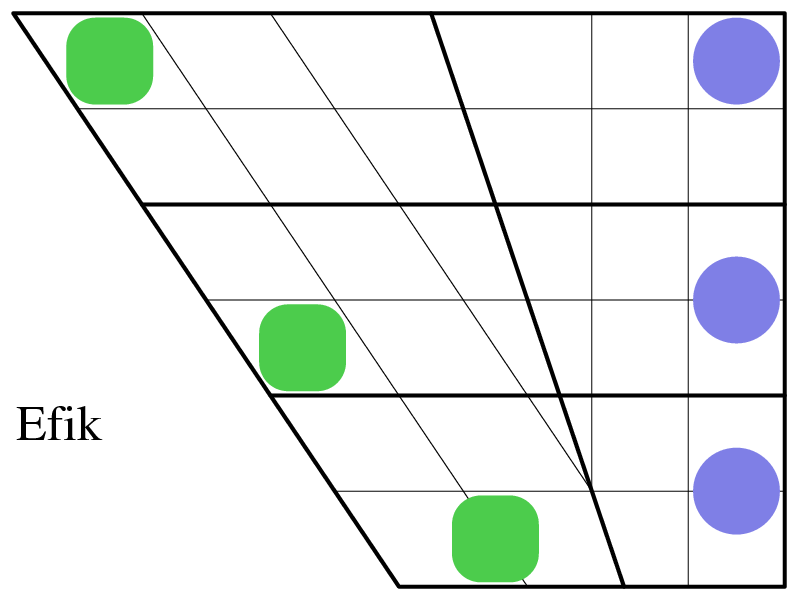 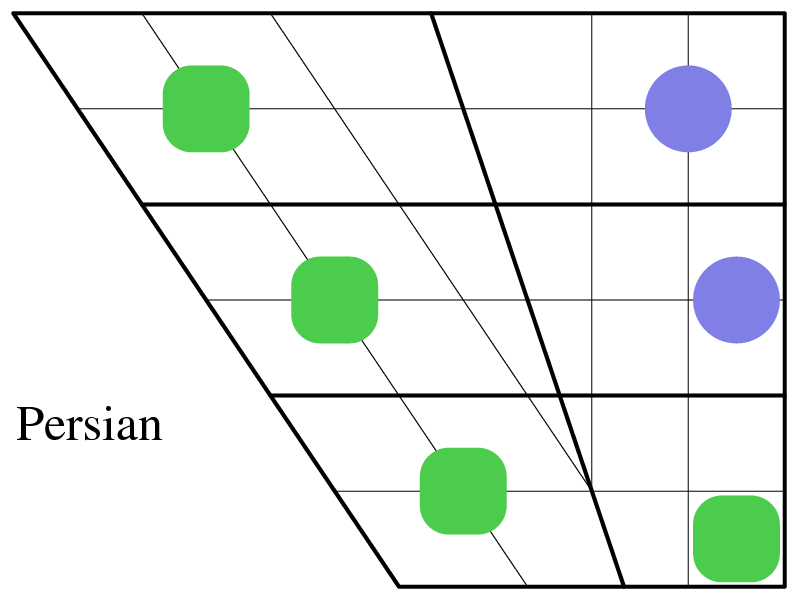 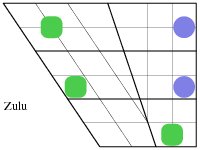 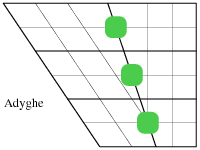 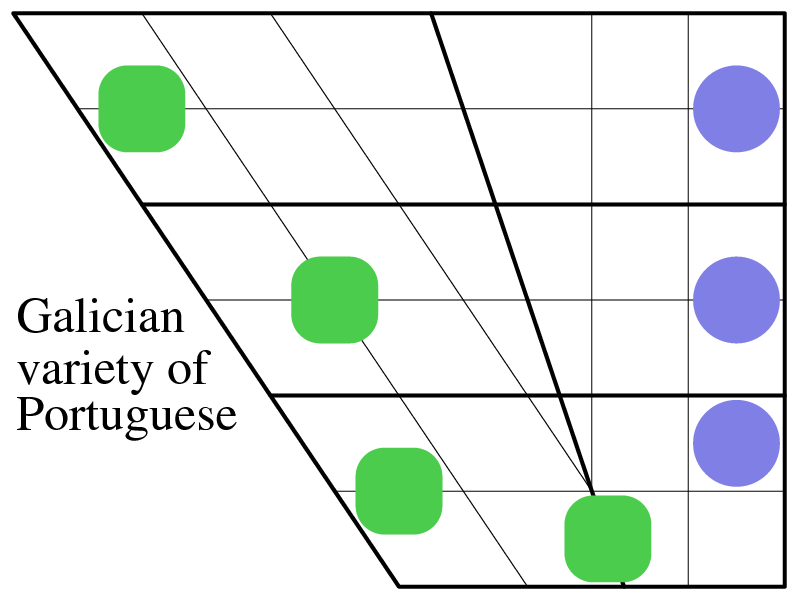 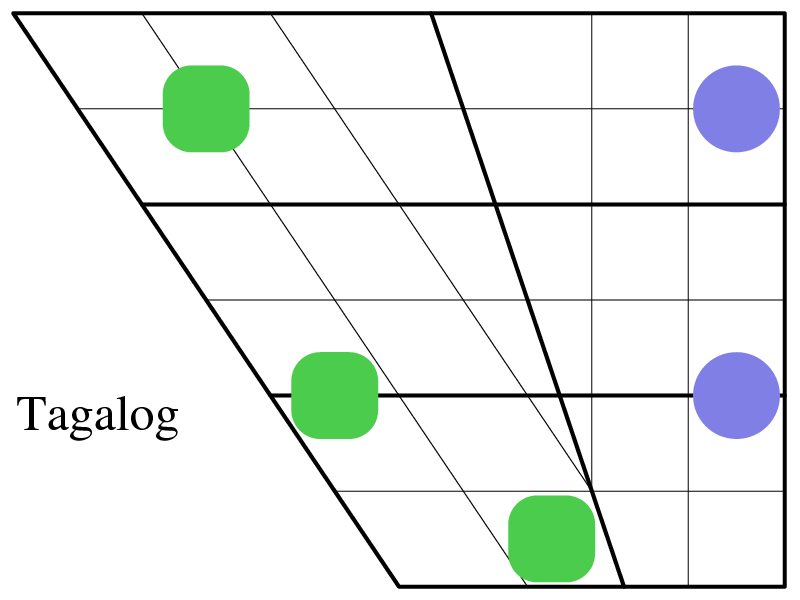 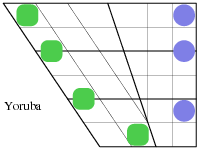 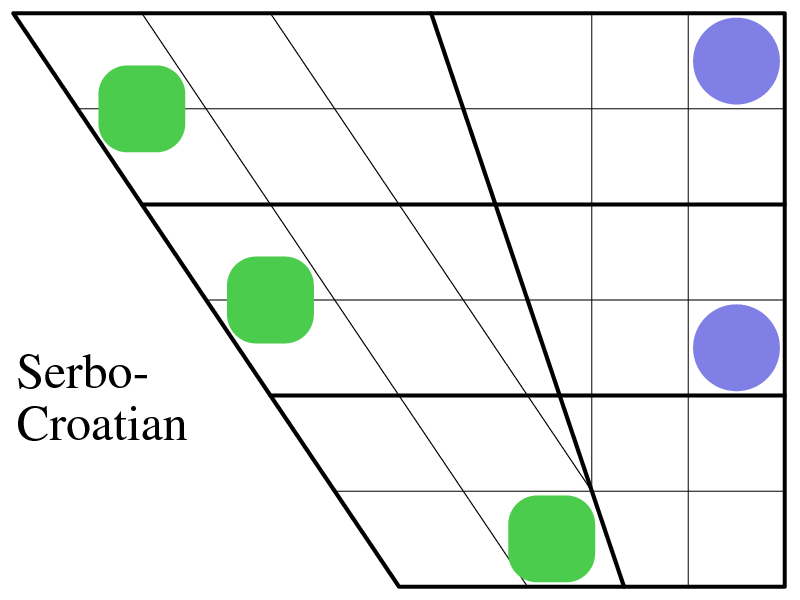 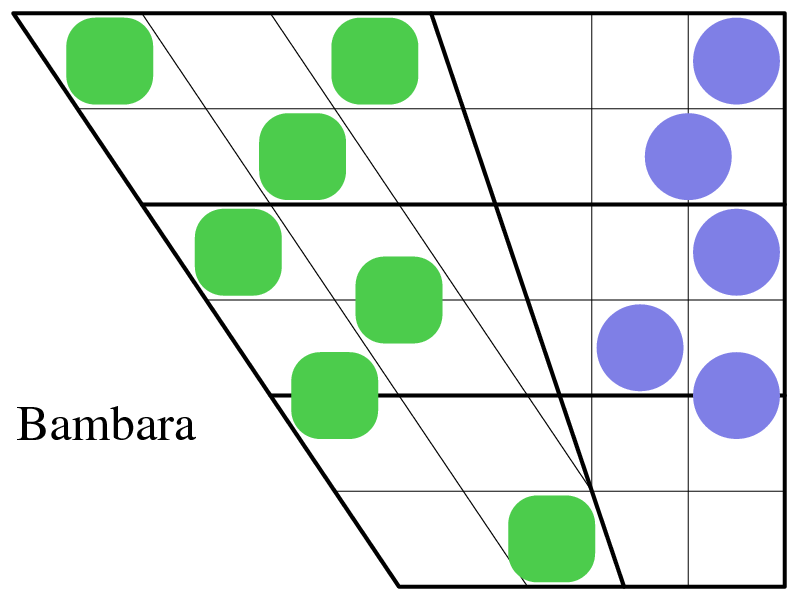 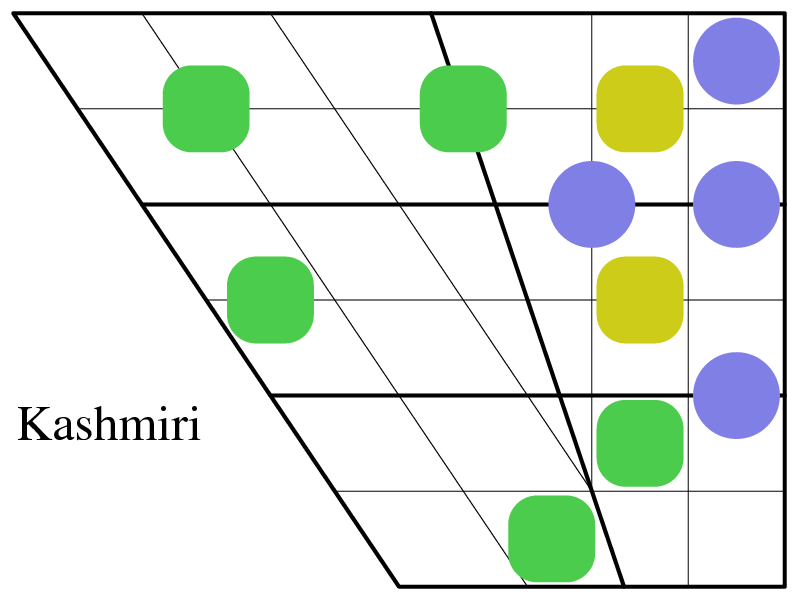 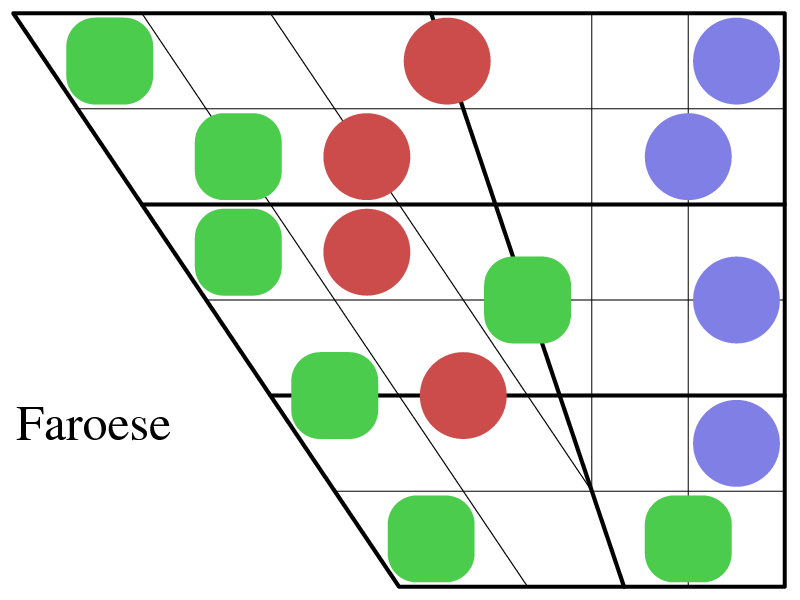 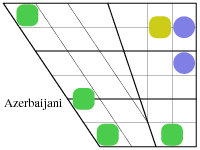 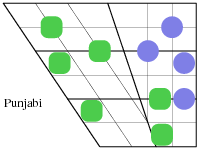 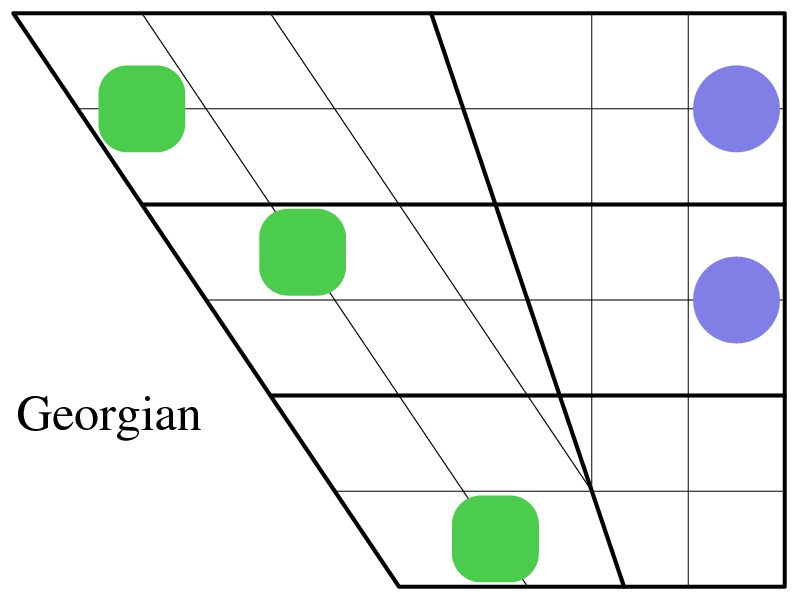 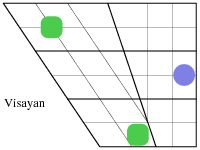 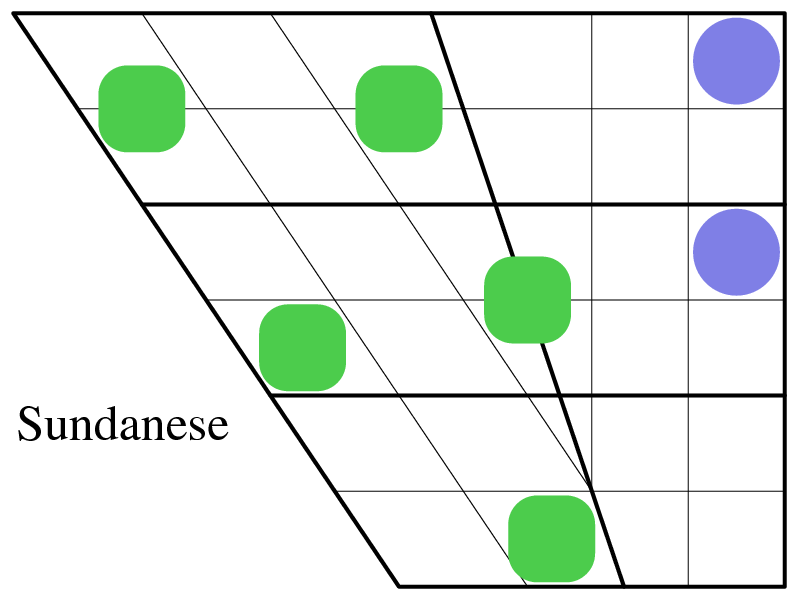 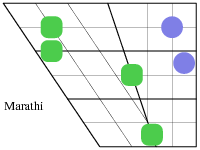 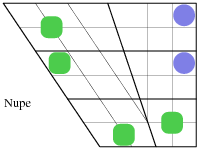 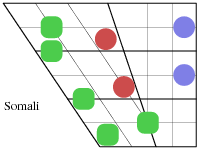 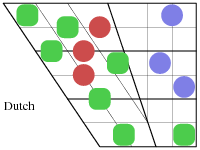 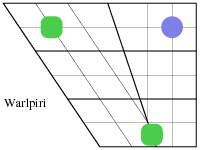 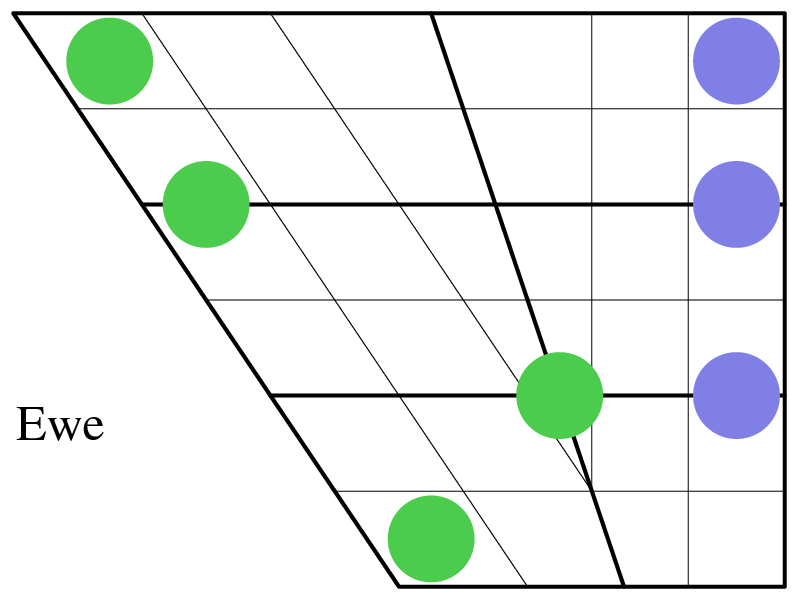 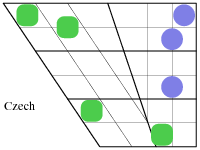 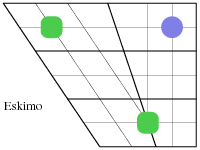 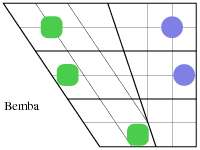 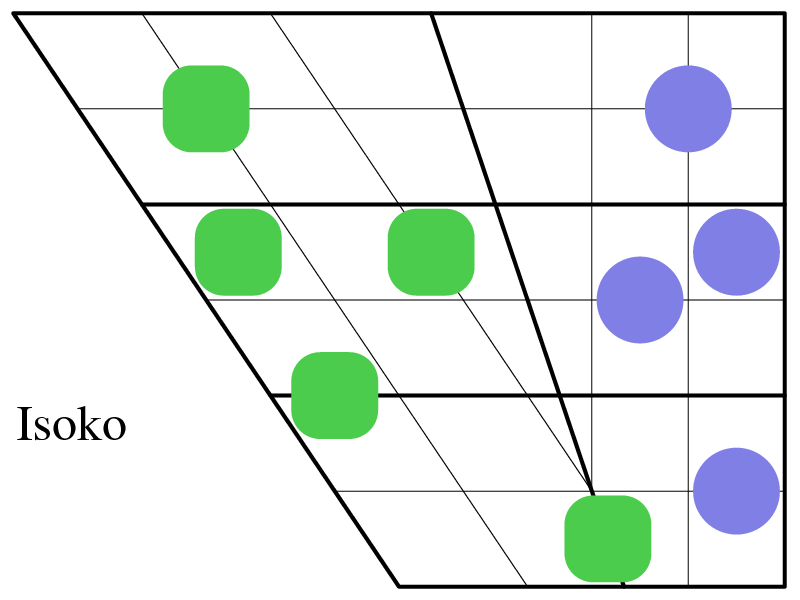 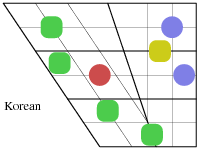 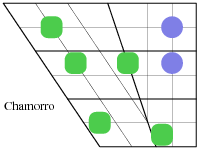 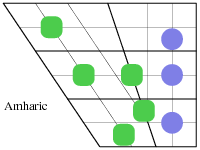 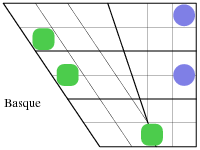 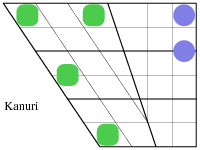 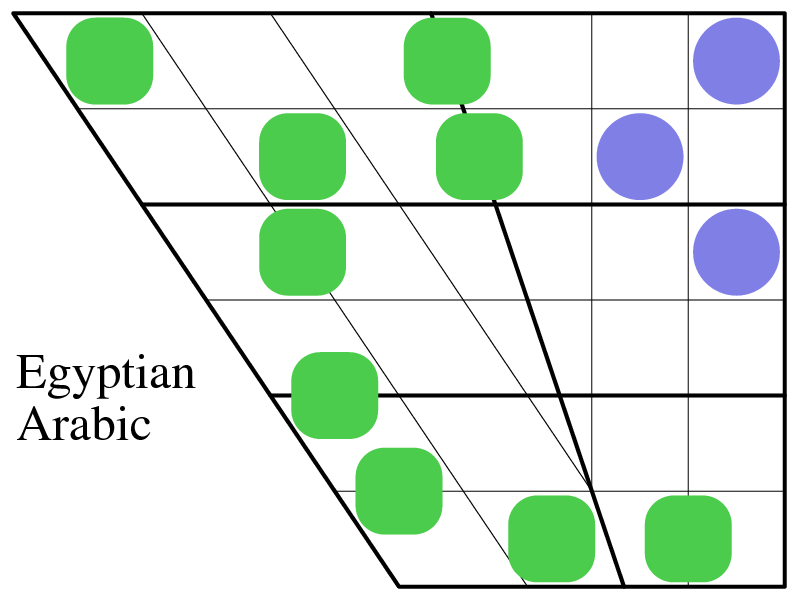 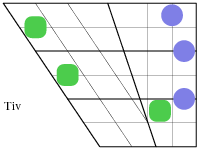 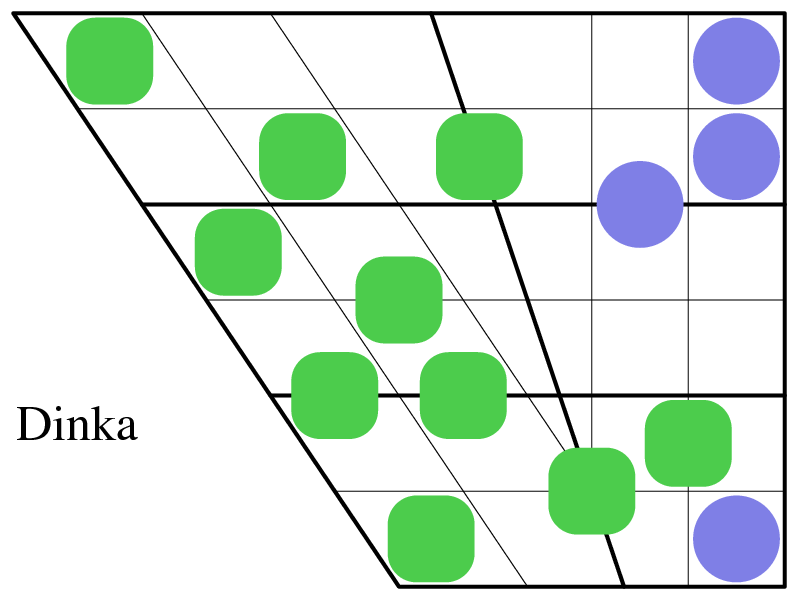 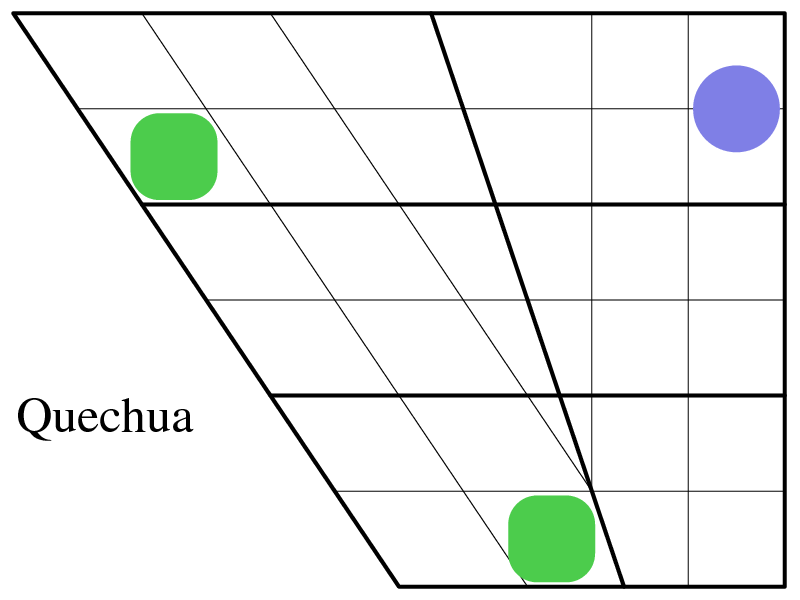 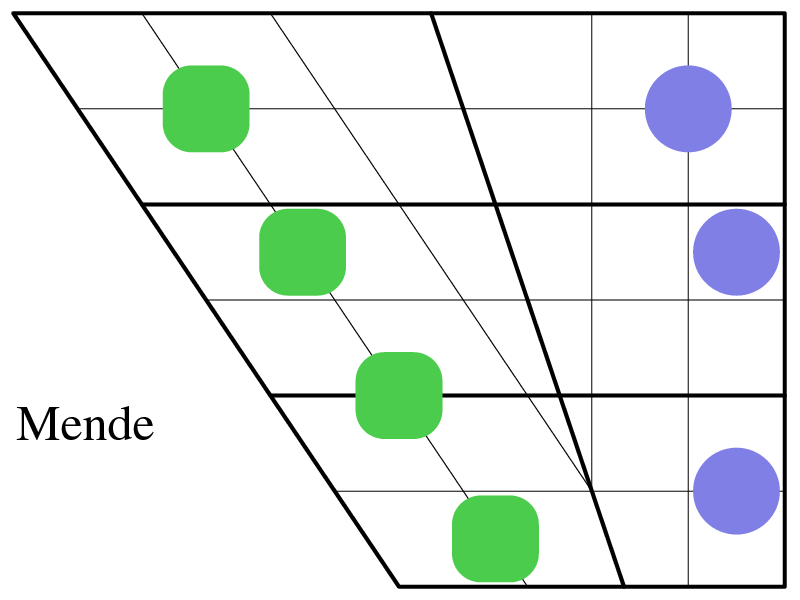 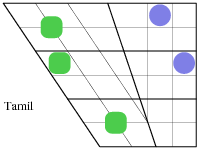 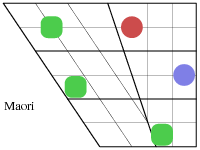 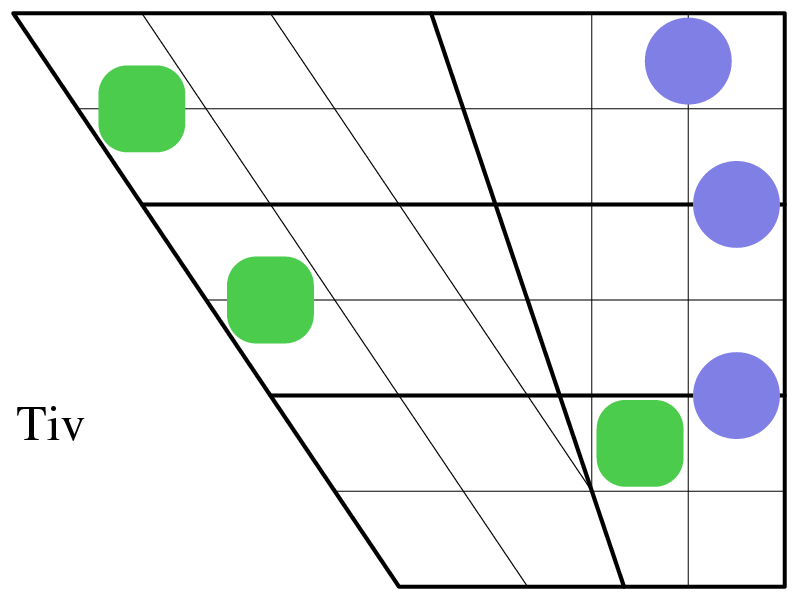 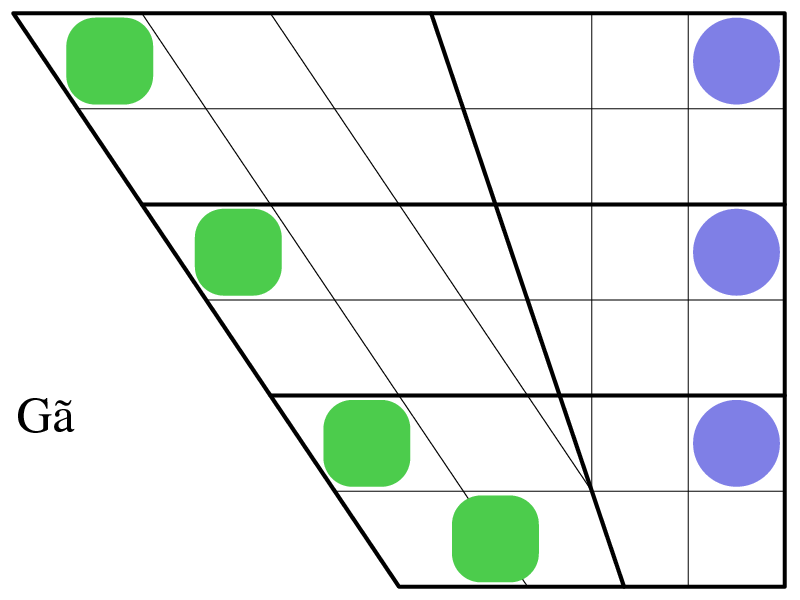 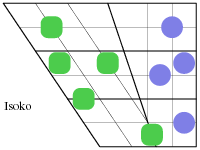 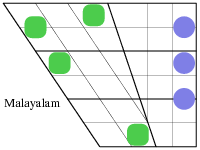 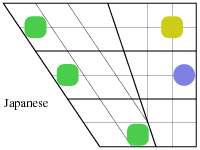 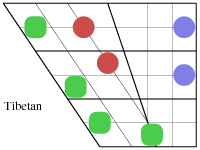 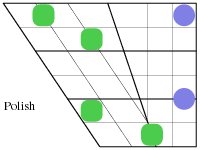 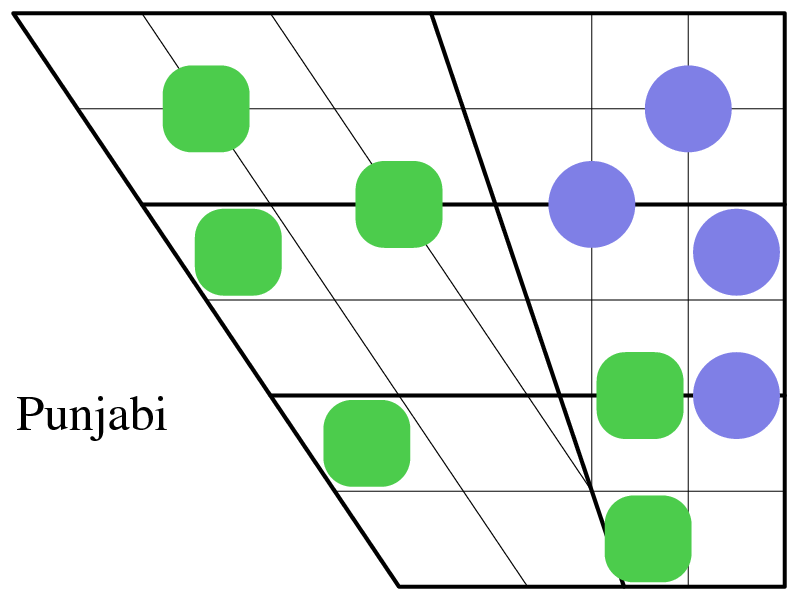 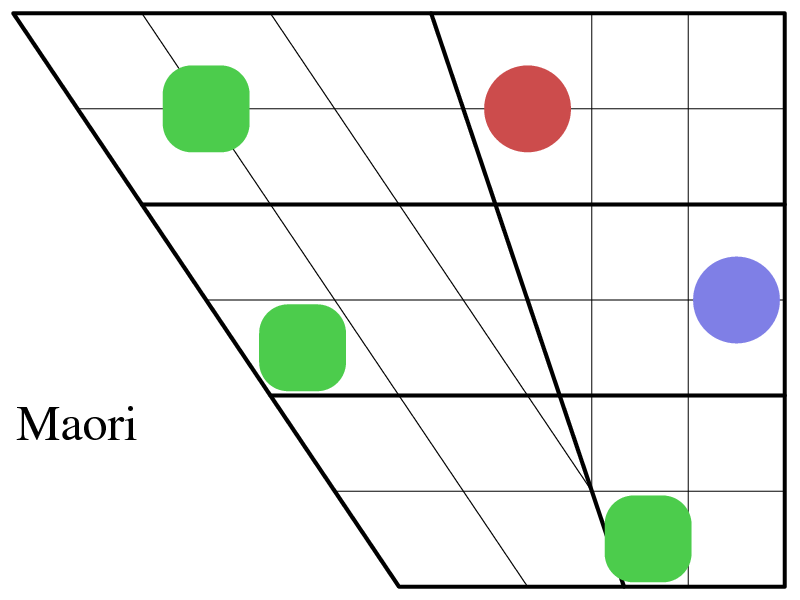 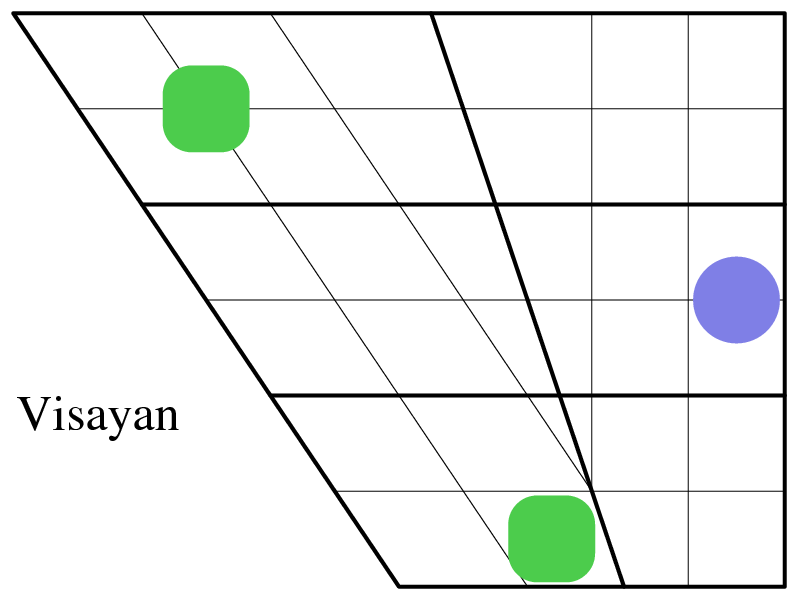 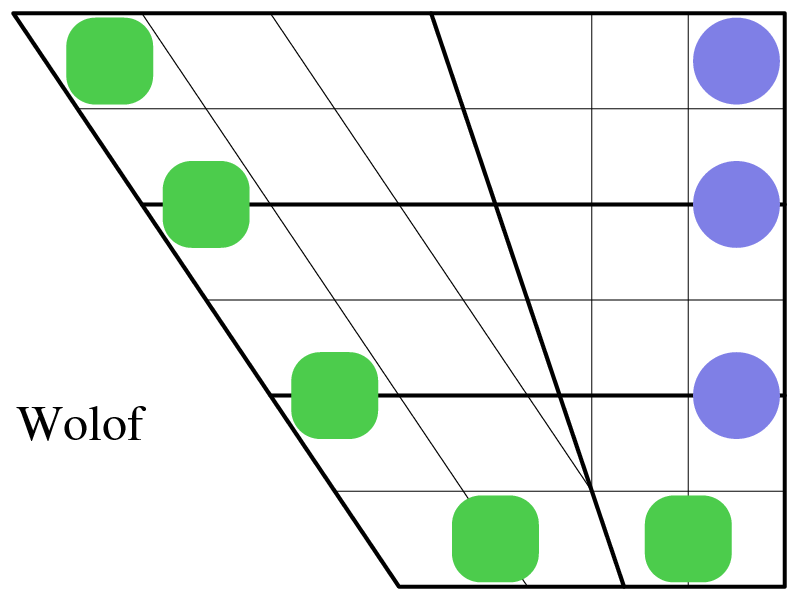 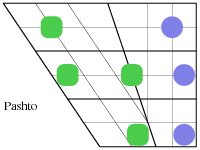 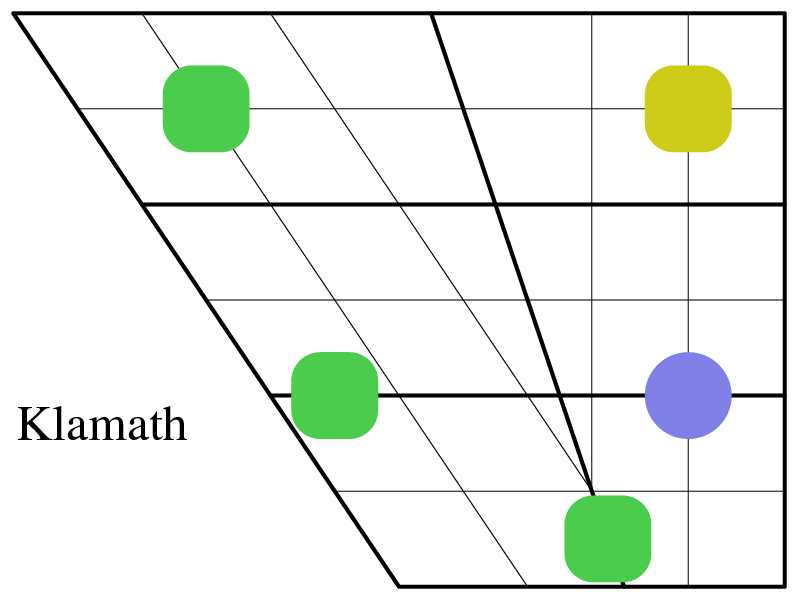 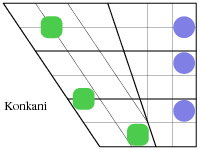 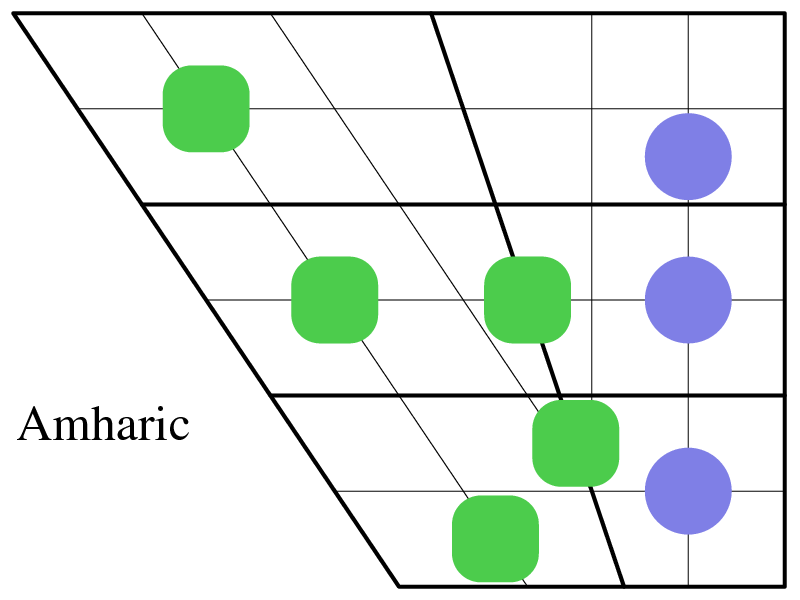 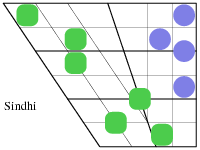 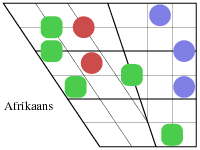 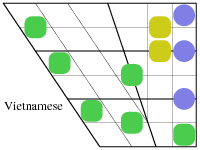 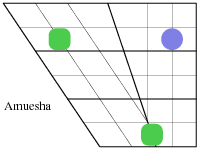 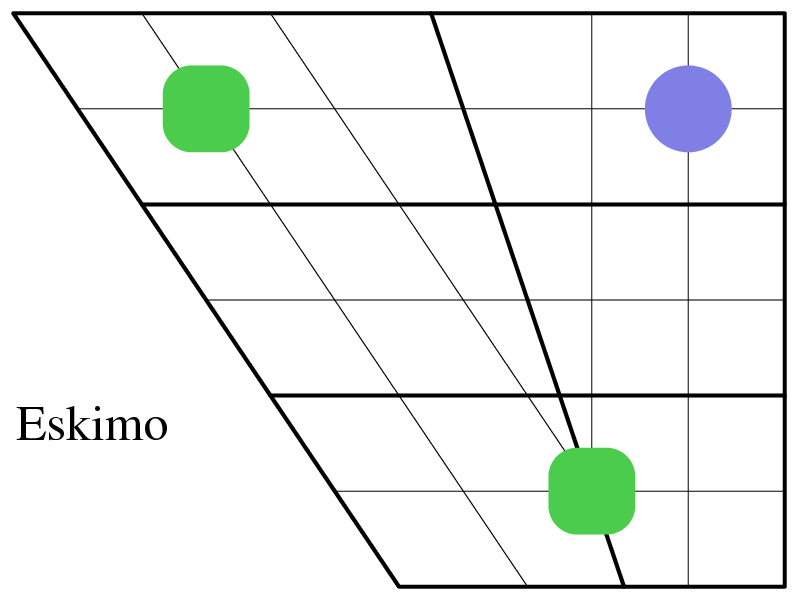 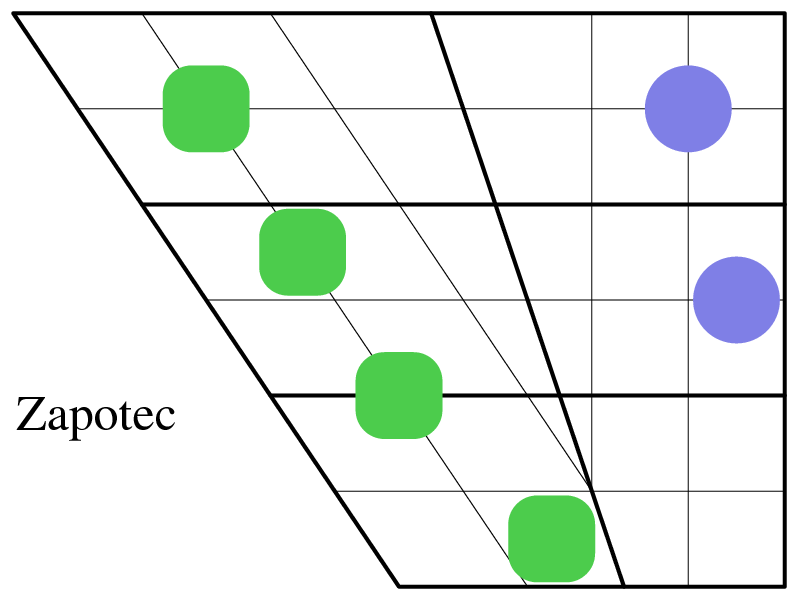 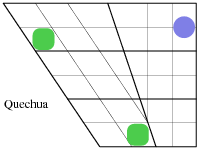 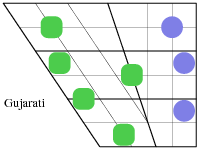 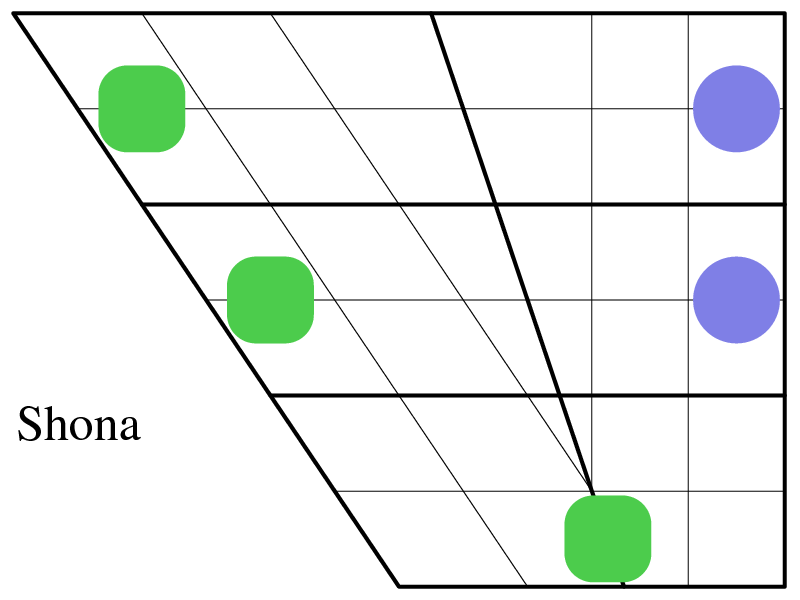 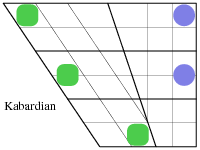 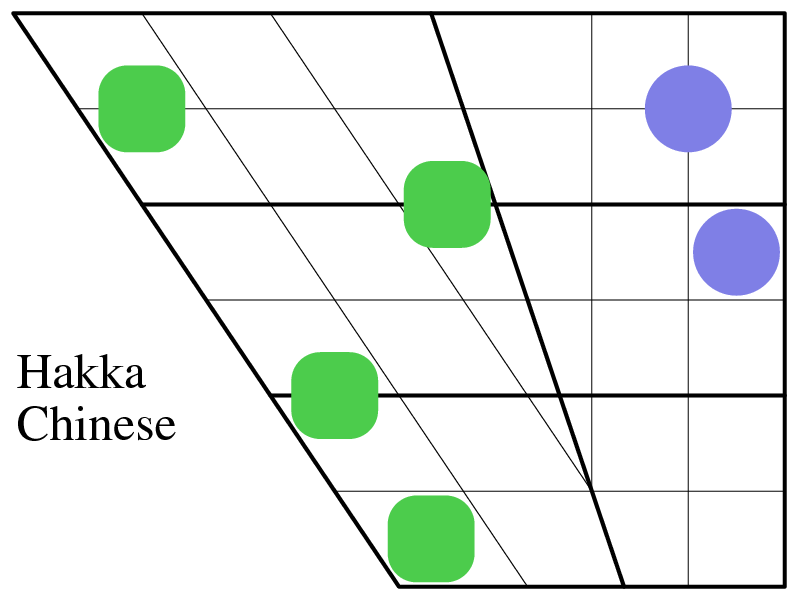 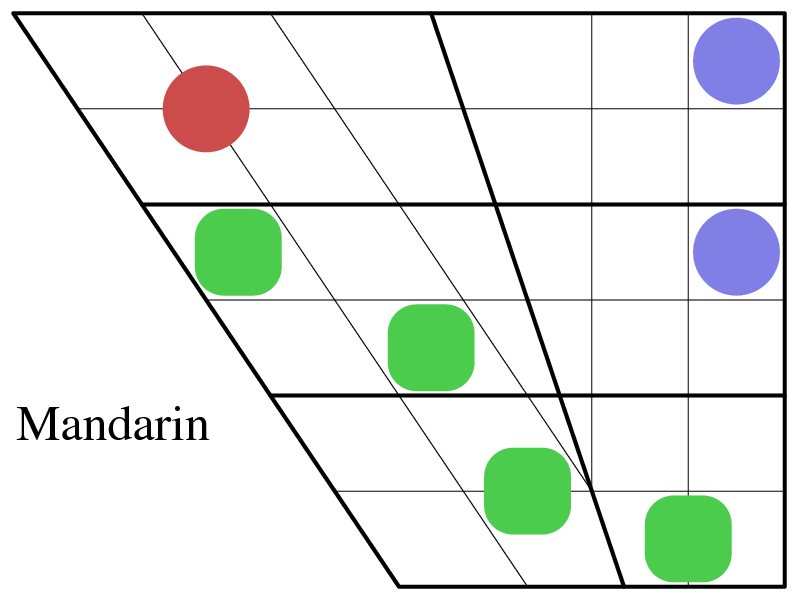 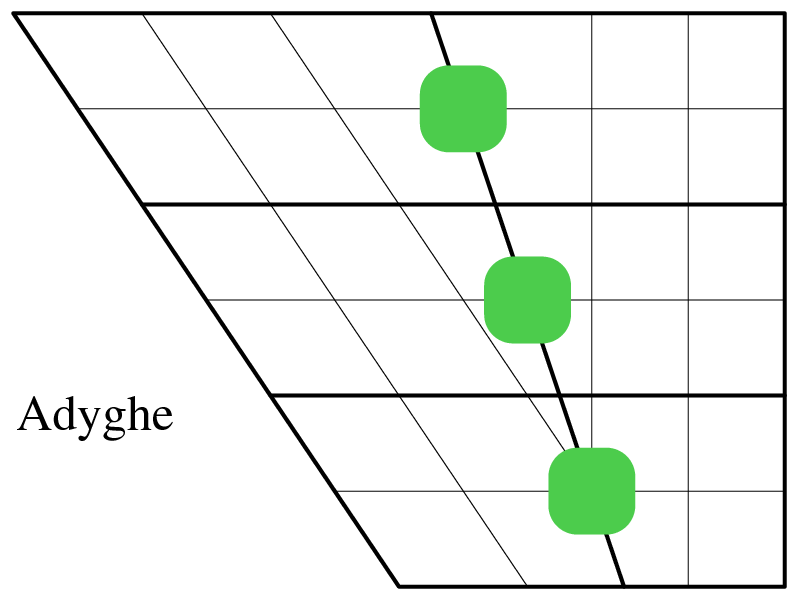 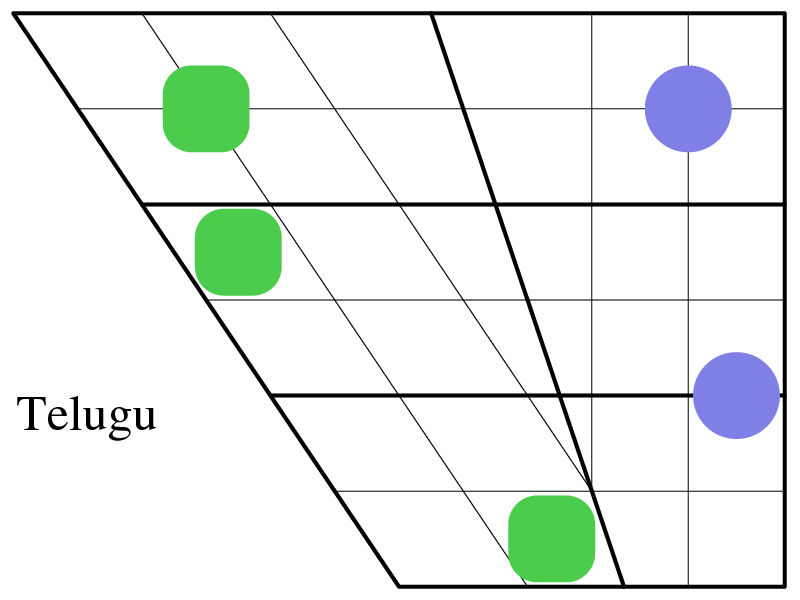 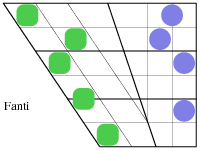 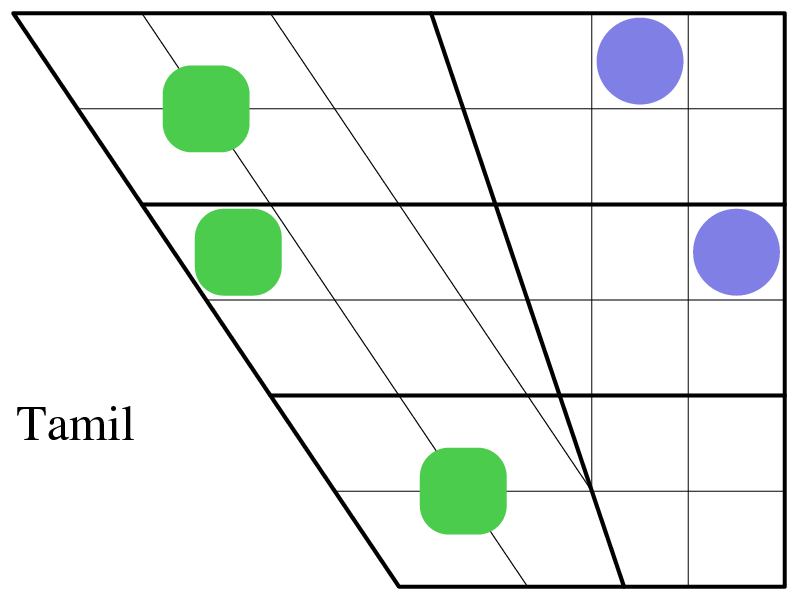 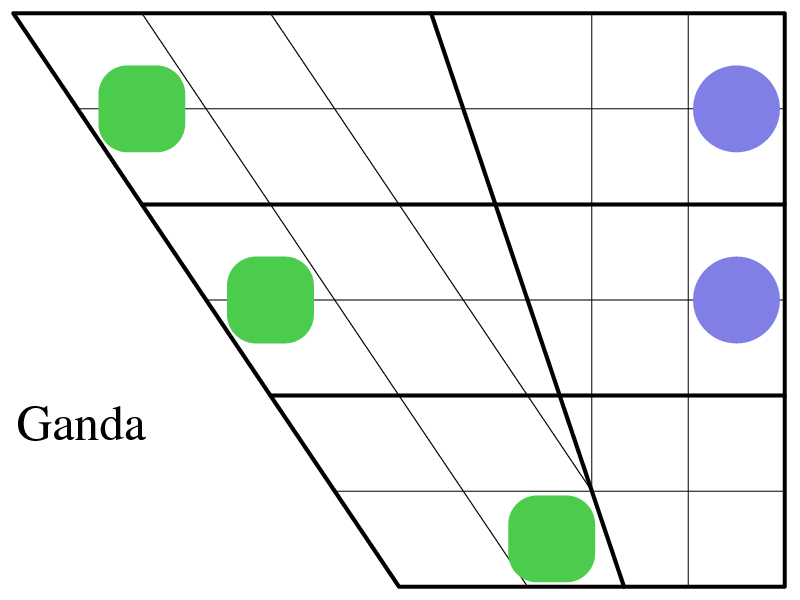 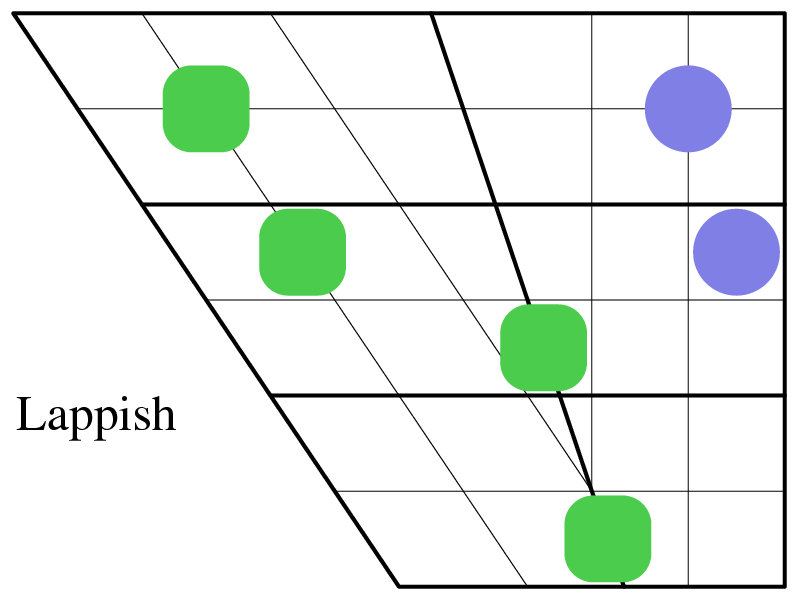 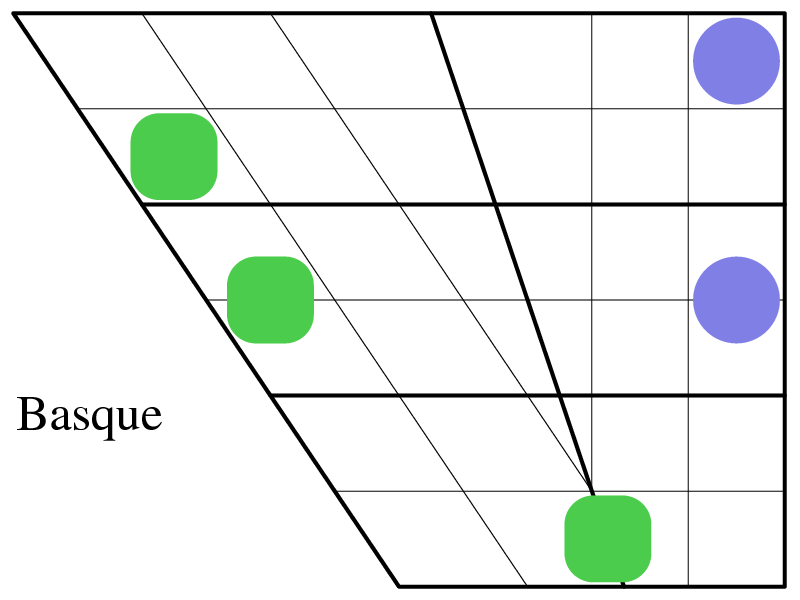 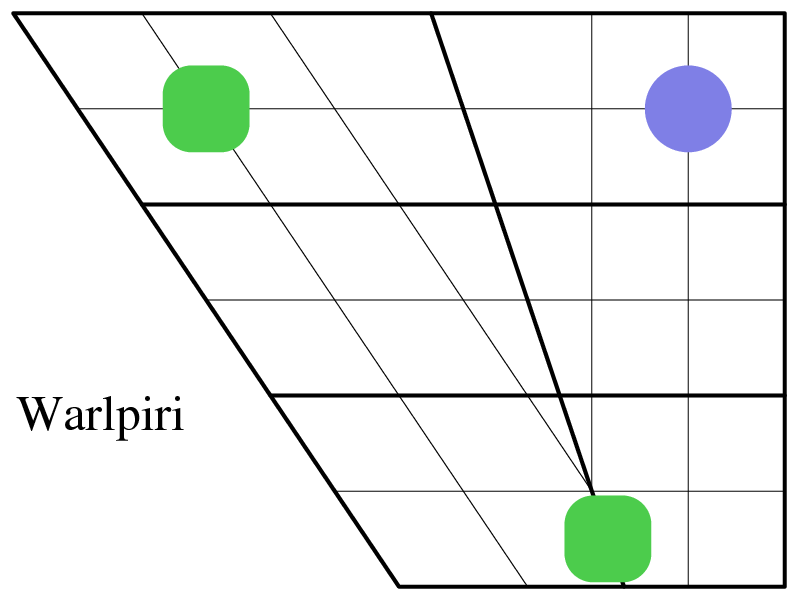 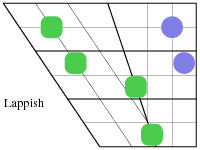 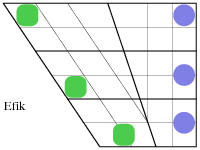 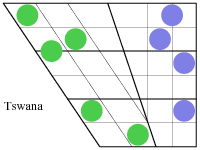 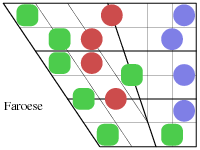 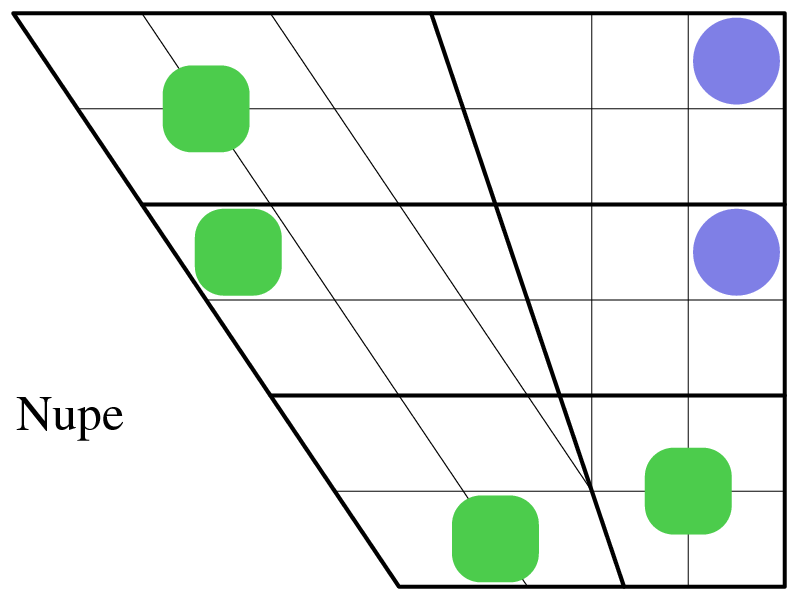 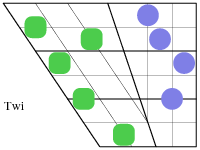 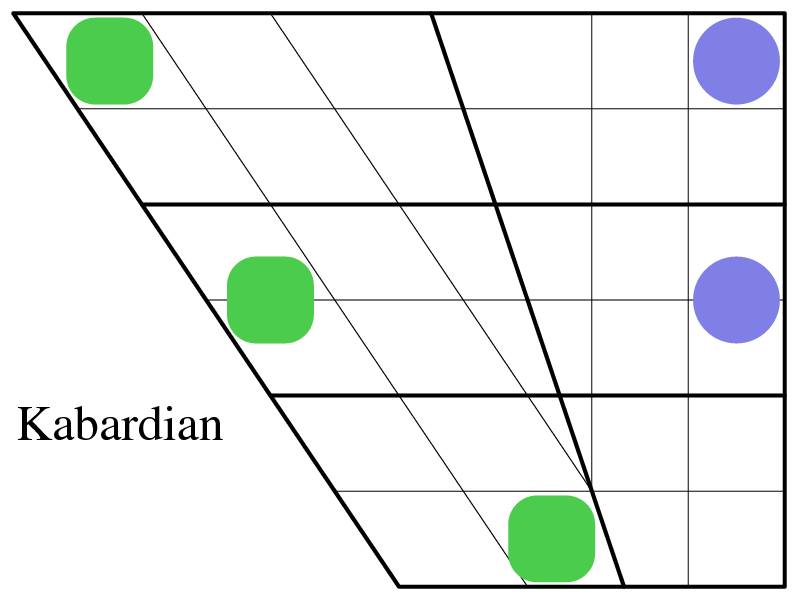 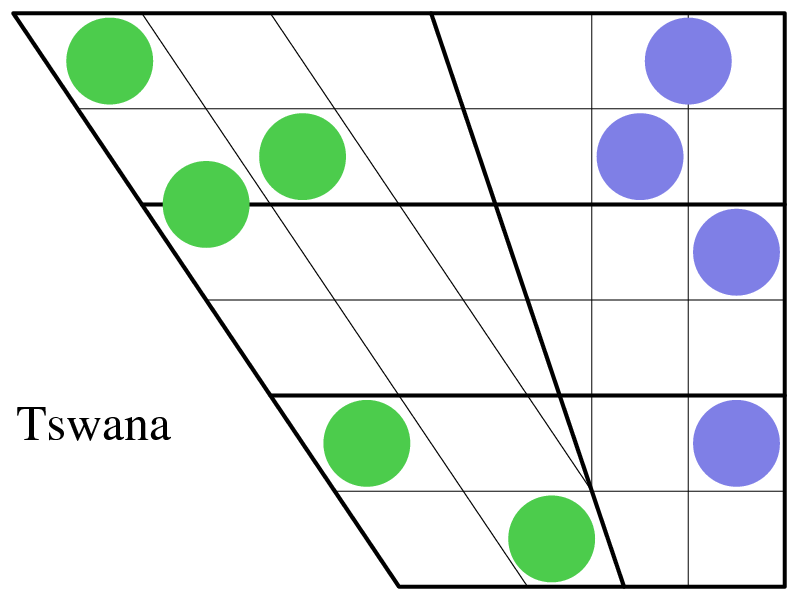 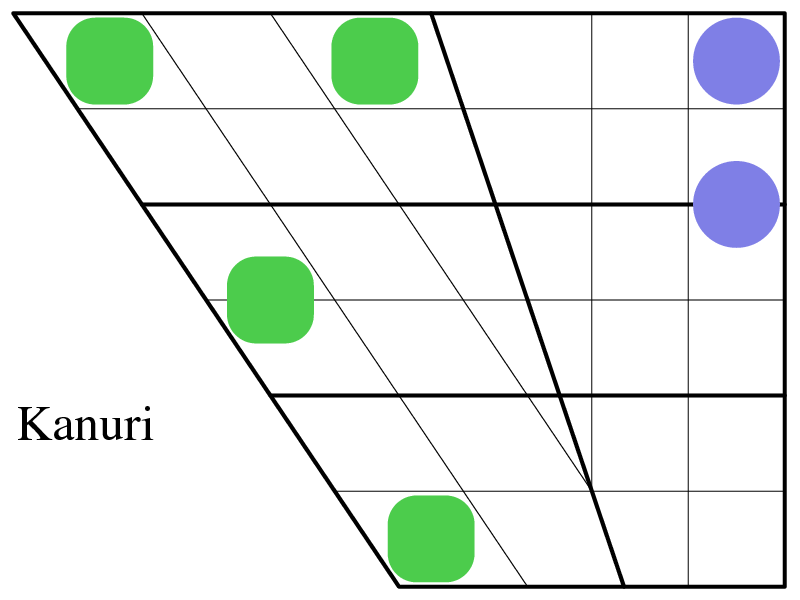 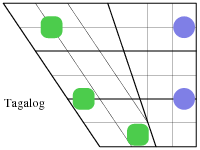 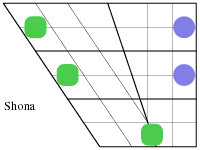 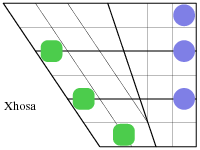 Each is centred in one of the squares, quadrilaterals etc of the diagram or on one of the lines of the grid in order to emphasise that the placings are schematic and symbolic and to convey the judgement that more delicate positionings or indicators of smaller sizes would undesirably suggest what should be considered inappropriate not to say spurious precision.